As we head into the cooler months of the year, don’t forget that the garden can be as beautiful in late autumn/winter as during spring and summer. The cooler months bring with them the beautiful structure of the bare trees with their interesting shapes and bark colours, as they drop the final stages of their autumn leaves and the first frosts cloak them in a glistening white. 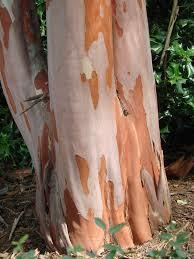 What better time than now to see the amazing colours of the bark of crepe myrtle. This beautiful, small tree not only has amazing flowers in mid-autumn, but they’re followed by glorious coloured leaves, which fall to reveal the greyish pink bark that is a standout feature of this plant. A recent addition to the crepe myrtle range are the new purple leaf varieties that add another colour dimension to the garden during the warmer months of the year. Another great tree for winter colour is the golden ash, which after losing its leaves is left with lovely yellow branches that give an eerie look through the frost and fogs of winter. The winter garden brings with it the flowering of many plants including the glorious hellebore. These beautiful perennials thrive under deciduous trees as they are protected from the summer heat. As the leaves fall they are exposed to the winter sun, where they throw out their clusters of softly coloured flowers to face the sun. There has been an amazing amount of breeding done with these plants in recent times, bringing many forms and colours to the gardening world. They come in single and double forms and a wide range of colours from white, through shades of pink and burgundy to greys and yellows. New stock of these lovely perennials should be available in nurseries at the moment. Remember to plant them where they receive summer shade. To mention again from last month, another group of plants that perform very well in the cooler months with their late autumn to winter flowering are the Camellia sasanqua. This group of plants has many uses, from screening to espalier and ground covers. 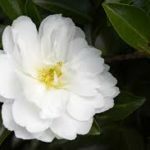 The ground cover varieties, Marge Miller and Snow, look fabulous in a large pot or as a groundcover hanging over a wall or under and around the base of upright forms of camellia. It is timely to remind gardeners that it is too early to prune roses and fruit trees as they won’t yet have gone into dormancy and by pruning early you could encourage new growth … and for those of you who get a frost, the new growth can be burnt off. Also some late general fertilising of most plants will give them a final boost through the cooler days of winter. Finally, the flower and vegetable gardens should be well and truly planted with winter/spring plants. Pansies, viola, primula, wallflower and stocks are just some of the flowers that can go in now. 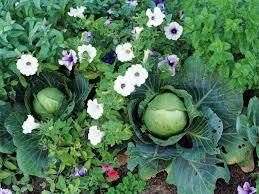 Cabbage, cauliflower, broad beans, onions and carrots are some vegetables that could be given a go. 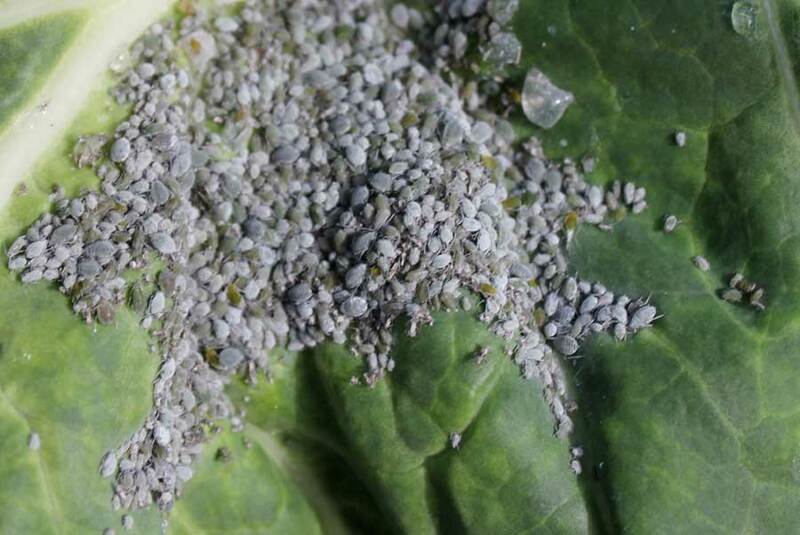 Watch out for the cabbage moth as they can do some early damage on cabbages and cauliflowers etc. As the daylight hours start to shorten, they bring cooler nights and deciduous trees start to change colour—the trees we relied upon to give us some shade from the relentless, hot summer days. Deciduous trees are not only grown for the summer shade they provide but also for colourful autumns and their bareness in winter to allow the sun in, to warm our homes and gardens. Care must be taken with the selection of these plants as many are very large trees with invasive roots and need a large area of land to grow to their full potential. With many new varieties that growers have developed to fit into our ever-decreasing parcels of land, it is often hard to decide what tree to use. My suggestion is to have a look around your local neighbourhood to see if you can spot something that you like. Then ask the owner of the property what it is, or check with your local nursery person. Generally in this district many of the shade trees have been growing for several years and have reached their ultimate size. By doing this before making your selection, you will know for sure that a particular plant will actually fit that site. Autumn-colouring trees come in many forms and each variety has a particular feature that distinguishes it from other varieties. For instance, a Golden Ash is a medium-sized tree reaching in the vicinity of eight to ten metres tall by six or so metres wide and is more suited to a large space well away from buildings. Its main feature is the beautiful golden foliage in autumn with striking yellow branches. On the other hand, a Chinese Pistacia is a smaller upright tree to eight metres by four metres wide with beautiful orange-red foliage. It’s suited to a smaller garden and can be closer to a building. 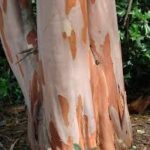 Many of the new Crepe Myrtle varieties, with their colourful autumn flowers, beautiful autumn foliage and in maturity their mottled bark, make attractive, small shade trees for any garden. 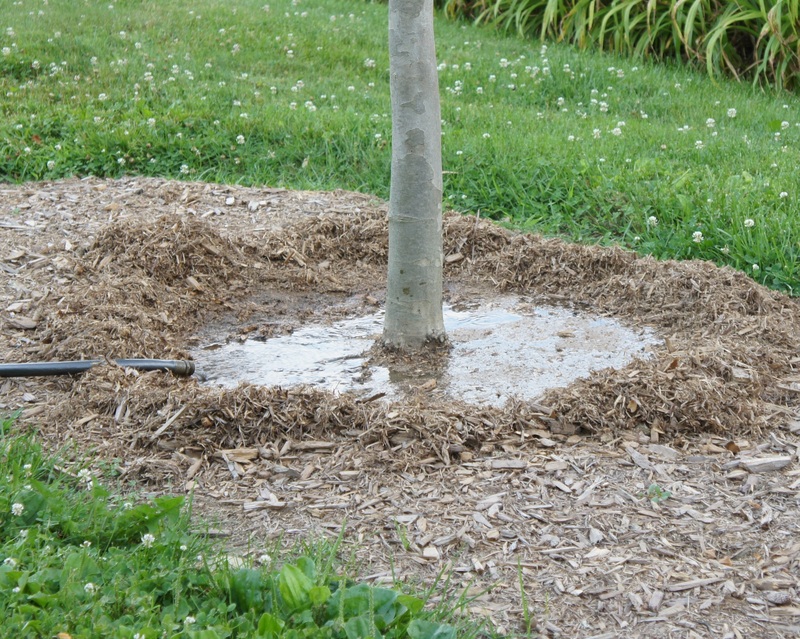 Deciduous trees also have different moisture requirements so planting moisture-requiring plants in a dry garden can cause issues. An example of this is Silver Birch, which prefers a higher level of moisture, particularly in summer, compared to the Golden Ash that prefers and copes better with a drier situation. When trees are used in the overall landscape of a garden the siting is of absolute importance. A large tree can dominate a garden and can often restrict the growth of colourful shrubs that require full sun. If you have a small yard, choose a small tree to place on the north or the western side of the house. With the movement of people to small acreages, I often get asked what I can suggest as a driveway tree or trees. Again, careful planning is very important: availability of water, animal protection and ensuring there’s enough room when the tree reaches maturity to allow high vehicles like cattle trucks or furniture removal trucks to access the driveway. In this case, using more upright species like some of the newer varieties of ornamental pears will give you the height you require with the avenue effect but do not take up a lot of room. When purchasing trees there are two forms available from nurseries: container-grown or bare-rooted. At this time of the year you will only find container-grown trees and although these might be a bit more expensive the tree can actually be seen with leaves on and is then generally alive and kicking. Take care later in the season if you wait for the bare-rooted trees: make sure that the trees have been treated with care and have not been allowed to dry, compromising their ability to re-shoot. After all this has been accomplished, talk to your nursery person about the best way to plant your tree and any ongoing maintenance. Welcome to another year of gardening tips and advice in The Triangle. With the great rain we have received over the last few weeks or so our gardens should be looking great—apart from the grass growing faster than we can keep up. This growth brings the usual tasks we can all associate with, and although these tasks can seem tiresome they are most essential in the overall upkeep of our gardens. Dead-head roses and give them a light application of rose food. This will encourage new flowering wood for an autumn flush and also assist in the prevention of summer pests and diseases. Take care of diseases like black spot and powdery mildew with a rose fungicide and control insect pests like aphid with a systemic insect spray. It’s better to use a preventative program of maintenance than only acting once you have encountered the problem. Do a regular preventative spray rather than trying to control the problem when it becomes evident. One preventative practice where chemicals are not required is to water roses in the early morning, placing the sprinkler in such a position so the plants are not watered from above. This will also assist in the prevention of fungal diseases. Summer pruning of fruit trees can also be done after the crop has finished. Thinning out a lot of the new growth made over the seasons since the major prune in winter will allow the tree to strengthen branches, giving it a better structure. Plant hygiene is also crucial at this time. Collect all spoilt fruit from under the trees. Also remove and dispose of diseased leaves from under the rose bushes. Perennial plants can also do with a tidy up, removing spent flower heads and any unsightly foliage that might have died. This will encourage another flush of flowers and carry through until early winter. Setting up the vegetable garden for the autumn crop can commence now. Most of the summer crops will be finishing off so it’s a good time to plan and prepare for the cauliflowers, broccoli, cabbages, onions and the like that prefer the cooler months just around the corner. Dig over the beds and add some animal manure and lime and let things rest for a few weeks. By that time the weather will have cooled and the autumn seedlings can go in. Remember to practice crop rotation therefore not following like crops with another previously planted. Autumn flower seedlings will soon be available in nurseries so keep an eye out for pansies, viola, primula, poppies, stocks and so on. For those of you who grow plants in pots, remember that the nutrient leaches out very quickly so it’s important to fertilise regularly—every two to three weeks with a liquid fertiliser and a top-up with a slow release every 3-4 months. This will keep them growing strong and also help prevent disease and insect pest problems. Good luck with all of the above—and bring on the cooler months! Keith gives a gardening talk at 11 am on the last Thursday of every month at La Galette in Tilba Tilba. All welcome. Well, here we are in another summer with Christmas fast approaching. With the hot and dry weather on its way there are a number of very crucial tasks that should be on your to-do list. Although we have had some good rain recently, watering of the garden, whether for newly planted or established plants, will keep them healthy and help them through the dry season. Many people say that they only purchase plants that have an indication on the label that the plant is dry-tolerant and that makes them happy because they don’t have to water that plant. This is a misconception, as all plants must be watered until established—this could be anything from months to a year. Even after that period it is important to apply water on a regular basis, again depending on the plant and usually by a slow deep watering instead of a spray at the stem of the plant with some high pressure nozzle. Lawns are also plants and these require a deep slow watering once every five or so days and not every other day. Watering deeply and less frequently will encourage deep rooting and this allows the lawn to hang in longer during extended drier periods. Hanging baskets require watering at least twice to three times a week as they dry out very quickly in the wind and sun. Watering of other pots will depend on the type of pot, the type of plant and, more importantly, the type of potting mix you have used. It is also important with any type of plant container, whether basket or pot, to fertilise regularly. The nutrient drains out fairly quickly and regular fertilising (every two weeks or so with a liquid fertiliser) will encourage strong and lush growth. Another very important task is mulching. Apart from watering and feeding of your plants, mulching is the most important garden task during the warmer months. Not only does mulch reduce the need for serious amounts of water but it also reduces weeds’ ability to take hold. Mulch comes in many forms, from gravel through wood types to soft mulches like pea straw, sugar cane or lucerne. These soft mulches are best for flower and vegetable gardens which, as they decompose, add nutrient to the soil and improve the soil texture and structure. The heavier mulches like wood chips and gravel can be used in more permanent garden beds like shrubs and other permanent plants. Other tasks that should be carried out during this period include dead-heading of perennials and roses. Completing this task on a regular basis during summer will encourage new growth, which in most cases will encourage repeat flowering and keep the plants in a tidy condition. Keep an eye on fruit trees for pest and disease control. Fruit fly will be out and about, particularly on stone fruits and citrus. There are several very good controls, both non-organic and organic, and contact with your local nursery will avail you of the correct application for your situation. Stone fruit will require some fungal spray to prevent brown rot if we start to get some summer rain. Again, talk with your local nursery staff to get their advice for your situation. Other spraying should include insect spray for aphid and other sap-sucking insects as they can reduce the vigour of the plant and stress them even further when the temperatures rise. Last but not least I wish all the readers of Gardening Gabble a joyous and safe Christmas. Pots as a growing solution are increasing in popularity, and the opportunity is right to offer some hints on how to successfully manage this form of gardening. Probably the most important question is to decide what you want the pots and the plants to achieve. Are they to be used for growing vegetables? Annual colour? Perennials? Shrubs? Or perhaps a screening plant to hide a shed or some unsightly part of the landscape? The pot size is absolutely the most crucial factor as a pot too small for the plant will cause it to dry out quickly or blow over in the wind. Or it might not be large enough to contain sufficient nutrient and water to keep the plant healthy. Generally, glazed pots are the best as there are many colours to suit your colour scheme, and these pots have a better moisture-holding capability. There are some very interesting forms of light-weight pots on the market at the moment. These are easy to lift and move around and come in some very interesting shapes and sizes. Terracotta pots are very stylish but have a tendency to dry out, so if you want to use them, seal the inside of the pot with a terracotta sealant. When selecting a pot that your plant might soon outgrow, use a straight sided or V-shaped pot so the plant can be easily removed. A plant in a belly-shaped pot is nigh on impossible to repot without causing serious disturbance to the root system. When selecting the plant to be used, consider the eventual size of the plant. The larger the plant grows, the larger the pot should be. A plant to be used for screening needs a pot that will also act as an anchor in a windy site. Too small a pot will simply just blow over and in most cases break. If you are growing annuals, herbs or non-root vegetables, a shallow pot will suffice as they are all generally shallow rooting and do not need a great depth of soil. The potting mix used should be a premium mix with some slow release fertiliser and include some water storage crystals. There are many types of mixes out there but the cheaper the mix, the lesser the quality. Cheaper mixes are basically just pine bark and if you are growing vegetables and annual flowers you will need to fertilise and water more often as these mixes do not have any moisture or nutrient holding capabilities. The cheaper mixes will be of no benefit to the plants after a season or two. Watering and fertilising is of absolute importance. Vegetables and annual flowers will need watering several times a week and fertilising every ten days or so with a liquid fertiliser like a fish-or seaweed-based fertiliser. Shrubs and longer-living plants also need watering and fertilising on a regular basis although, with the fertiliser, add a specific slow-release fertiliser for the particular group of plants you have used. Do this three or four times a year as well as the liquid food on a monthly basis. During the cooler months this can be cut back as the plants are not actively growing. Just a few other things to remember: check from time to time that the drainage holes haven’t become blocked by roots; rotate the pots to get an even, all-over growth; and prune when necessary. Trees are probably the most important component of the landscape as they provide protection from the elements, add structure to a garden and provide habitat for wildlife, some we enjoy and others a bit naughty (the wildlife that is). Careful consideration should be taken when selecting a tree, as trees are there for a long time where other plants are not so critical to the overall landscape and can be moved or discarded depending on the circumstance. So it’s most important to look at a number of issues before the final selection is made. Firstly, what do you require the tree to do? To create shade for a particular style of garden that requires shade in the summer and sun in the winter? To screen out an eyesore in another location? To hang a swing off? The list goes on. To shade the western side of the home from hot summer sun is a very important consideration. 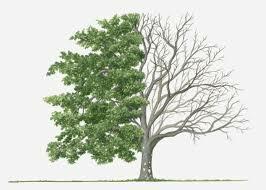 A large deciduous tree can reduce the inside temperature of a home by several degrees in the summer where in the winter the sun can get through to warm the home when the tree is dormant. Consider, though, the eventual size of the tree so it doesn’t interfere with the home when fully mature. Plan for the tree to be one and a half times the distance of the eventual radius of the tree, from the roofline of the home. Consideration of utility services like sewerage, water lines and powerlines is most important. Town councils have made the mistake of planting large trees like oaks and plane trees under powerlines and then spending enormous amounts in either cutting the trees back every year or creating some very unusually shaped trees. Although I am a great lover of trees I firmly believe that a lot of our beautiful Australian native trees, like Eucalyptus, are totally misused in the landscape. Some of these trees can grow to a massive size and can be fairly unstable in extreme weather conditions and therefore should be used wisely in the landscape. Thankfully the horticultural industry in recent years has developed a range of smaller mallee-type trees and small grafted species that are fabulous for the home garden situation. The larger species should wisely be left to open farm locations where they can be allowed to grow undisturbed away from buildings and the like. After you have decided to plant a tree in the garden the decision then is to the species. There are many new varieties that have been developed in recent years to take into consideration small urban and town blocks—trees that cause very little problems to the gardener. Some of my favourites include a number of varieties of ornamental pears, birches, pistachio and crab apples. Luckily all these trees are available all year round, either open-rooted in winter or container-grown in the warmer months. Planting at any time of the year is alright as long as, in the warmer months, adequate water is applied to reduce transplant stress. 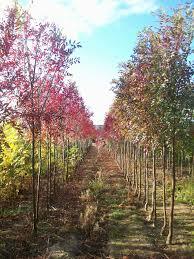 The subject of tree selection and planting is extensive and more than this space allows. Talk to your friends about their experiences with trees, take a drive around the local community and observe what others have done, or most importantly, talk to your local nursery person for their advice.It’s a cover up! 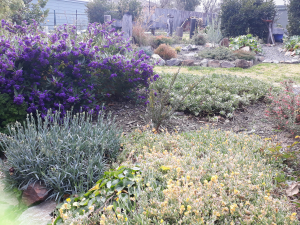 Customers regularly ask me to suggest a groundcover for a particular situation in a garden and with so many different forms, both Australian and introduced, the decision usually comes down to what you actually what the plant to do. Ground cover plants vary from conifers through Australian natives to perennials and introduced plants from outside Australia. Many are absolute ground huggers and others can reach 50-70cm high but can be as wide as 3-4m. There are categories that will tolerate first line coastal to varieties that can handle severe frosts and low water. Others are shade tolerant and many are edible, like herbs. We will start with first line coastal. Many of the plants that suit this situation are Australian natives and a stroll along coastal gardens and natural areas will soon give an indication as to what species are handling this difficult growing area. Species such as Carpobrotus (an Australian native succulent) are very good for dune stabilisation along with Banksia and Westringia, which both have groundcover varieties, as do Myoporum and Hakea. A good non-Australian plant is the Shore juniper (Juniperus conferta) that will mat well and stabilise sandy soils. Moving away from direct coastal we then move into more protected locations with heavier soils and not so much wind. In open sunny positions in these locations the list is endless. Australian natives include Grevillea, Leptospermum, Callistemon and Banksia with many others that are softer perennial types including Scaevola and Brachyscome. Non-Australian plants include groundcover camellia (Marge Miller and Snow), carpet roses, Cotoneaster dammeri, Convolvulus … and the list goes on. Shaded gardens are always a bit of a problem but here also there are many plants that can be used in combinations with perennials including camellias, Chinese star jasmine (often used as a climber) and the very beautiful Gumpo azaleas. Herbs are the most likely category of groundcover that do not get much of a mention but there are many of great benefit. These can be used to cover paths within the herb and vegetable garden or to cover a retained area within the garden. Several varieties of thyme are suitable for walking on and prostrate rosemary also falls into this category. The ground preparation for groundcover plants is the same as for all other plants with the inclusion of some compost mixed with the existing soil to give the plants a good start. There is a common mistaken belief that ground cover plants will provide weed suppression. There might be some weed suppression but generally weeds will still grow through the groundcovers and will be very hard to remove after the plants have established. Ideally the best method is to lay down several layers of moist newspaper and cover with a moisture retentive mulch prior to planting and then pull paper and mulch aside sufficiently to make the planting hole. Plant the plants and then water in and pull paper and mulch back around the plant. Over the period the newspaper takes to decompose, the weeds would have most likely died. Some careful hand-weeding and spot-spraying after that will ensure the garden stays weed free. Every garden has different requirements so it is important to seek qualified advice before making your choice. Your local nursery person will have many years of experience to help you make the right choice to complete this very rewarding project in your patch. Well, here we are with winter on the way out and spring not too far away. New growth will start to appear on deciduous plants, perennials wake after their enforced winter hibernation and bulbs pop up everywhere as new life begins. The next couple of months involves many tasks in the garden, including the preparation and planting of the spring vegetable garden, planting of flowering annuals and the completion of late winter and early spring chores that need finalising before too much new growth on plants appears. 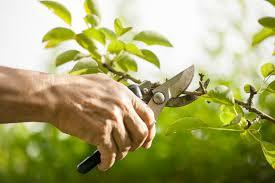 You should be close to completing the pruning of deciduous fruit trees and roses. Winter spraying must have been completed and if not just check that the buds are showing a slight colour and have not burst. If they have burst then you have missed the boat and any spraying with a winter spray could burn the blossom leading to no or very little fruit set. New growth on roses and fruit trees is a delicious target for aphids so keep an eye out for them. Spray with an organic insecticide and this will halt their progress. The vegetable garden should be getting the finishing touches prior to planting. Initially the garden should be dug over to spade depth and a spreading of lime (500g per square metre) all over applied. Some well-rotted cow or poultry manure can be added and forked in. If all this preparation sounds too much it should be remembered that a fast growing vegetable is a delicious vegetable. Plants that grow slowly are usually bitter and poor performers with small fruit or reduced crops. When planning the spring vegetable garden it is important to remember to practise crop rotation. By this I mean don’t plant the vegetable in the same position as you had it last season. This applies particularly to tomatoes and potatoes as these two groups of plants are in the same family and any pest or disease lying dormant in the soil could cause problems with the new crop this season. Another trick is to go for quick turnover vegetables that can be picked and replaced regularly like lettuce, Asian greens, beans and spring onions. Plant taller vegetables like corn and tomatoes on the side of the garden that is less likely to shade the rest of the garden. This month will see the last chance to plant bare-root fruit trees and roses and, as I have said many times, it absolutely vital you pay particular attention to the condition of the plants you are about to purchase. Poorly stored plants in retail situations can lead to dry root systems and if this has happened the chance of the plant failing to re shoot is very high—money ill spent. Look for plants that show no signs of the bark shrivelling or the very dry roots. If there is any indication of this, leave the plants alone. No matter what the discounted price might be, they will be a failure. Ensure, when planting these new plants, to prepare the soil well and water in. Sharpen the tools … the time is right! Well, here we are, well into another winter and the time is right to catch up with tasks in the garden to rejuvenate plants and other jobs that were missed during the warmer months. Start pruning in the rose garden and orchard as most of these plants will now be dormant. With the unseasonal warm weather, it has been a bit early until now to prune, with the sap in the plants still running. And pruning roses too early will encourage them to shoot, and these shoots could be burnt off with a heavy frost. Roses should be pruned reasonably hard, as the more new growth that is encouraged the more blooms will appear in late spring. If you are unsure how hard to prrune then these tips will help. Remove all dead or damaged wood. Remove any branches that are crossing over another branch or are growing into the centre of the bush. The idea is to keep the centre of the bush open in a vase shape to allow for better air circulation. This will decrease the chance of fungal diseases when the plants come into leaf again in spring. Reduce all the other growth by as much as half, remembering to ensure you have live buds below the cut and the uppermost bud is pointing away from the centre of the plant—basically pointing in the direction you want the new growth to point. Remember not to prune the ones that have only one flowering period in spring. These roses flower on the current season’s growth and if pruned in winter there will be no flowers. Pruning of these roses takes place in late spring after they have flowered. The pruning of deciduous fruit trees is a bit more complicated and if you are unsure of the technique I suggest you contact a professional horticulturist for some help. Fruit trees develop fruit buds on different types of wood so it is important to know these so you don’t cut off established fruiting spurs, particularly on apples and pears. Once you have pruned all the roses and trees, complete a spray of winter insecticide and fungicide to remove any over-wintering insect pests and fungal problems. Pruning of hydrangeas should also now take place and a method similar to that for pruning to roses is recommended. Hydrangeas flower on growth that has been made in spring on new season wood so the more that this is encouraged the more flowers you will have. Now is also a good time to divide and relocate summer flowering bulbs like dahlia and other herbaceous perennials. Divide them with a sharpened spade and dust with a fungicide to prevent any damage to the cut. 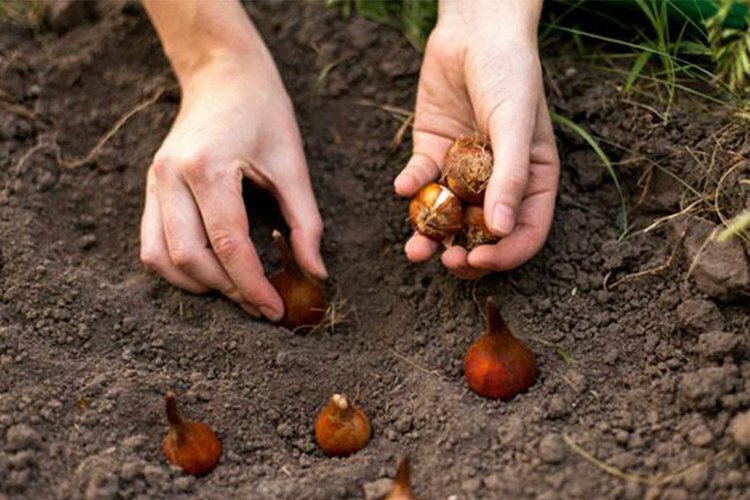 Plant them in the new position with a combination of cow manure and a handful of blood and bone to the existing soil. Remember that most herbaceous perennials like a well-drained soil, so slightly raised garden beds in full sun are the ideal. Still on the theme of pruning, remember that not every flowering tree or shrub in the garden needs to be pruned in winter. I have seen many spring flowering plants heavily pruned in winter and then no blossom appear in spring. Spring flowering trees and shrubs develop their flowering buds in late summer and autumn and if these plants require pruning, do it in late spring after flowering. They then have all the following seasons to develop new flowering wood. Remember to ensure all your pruning tools are well sharpened and clean before you start. Cleaning the cutting tools between plants with diluted Dettol or similar will decrease the spread of infection from one plant to another. With new citrus stock arriving in nurseries, now is a good time to talk again about this great group of fruit trees. I probably get more enquiries about this group of plants than any other in my day-to-day activities; it’s presently one of the most popular categories of fruit trees available. This is mainly due to the work done in recent times to provide dwarf forms suitable to pot culture or for our ever decreasing house block sizes. In growing citrus a great deal of importance is placed on where you live as many are not suited, for instance, to heavy frosts or cold southerly winds. Optimal temperatures for growing citrus are between 25 and 30 degrees Celsius. When temperatures get above 38 degrees growth is inhibited, although the plant will survive up to 50 degrees. Oranges and lemons are more suited to colder parts of our region although some frost protection is required in very cold locations. Limes and cumquats require a really warm, frost-protected site. Satsuma mandarin, Meyer lemon and sour orange are more tolerant of cold and can be grown in a more exposed position. Locations along the coast like Narooma and Bermagui are suited to all citrus as long as they have protection from cold southerly winds. The site you choose should be in full sun with a well-drained, compost-enriched soil. The area should have as much wind protection as possible but most particularly, again, from southerly winds. Dig a wide hole—but not massively deep—and add a commercial planting compost to your soil. If you’ve made your own compost ensure that it has broken down sufficiently to mix with your soil. Remember, don’t completely change your soil when planting, but improve the soil you have. Once you have placed the plant in the hole, check to make sure when you backfill the hole that soil does not come up above the graft. Just fill enough to cover the top of where the soil came up to in the pot. If you don’t have sufficient room in the garden and you still want a citrus then try one of the dwarf forms. Mandarins, oranges, lemons and limes come in dwarf forms with at least two varieties of each available. These are all suitable for growing in pots. Pot culture of citrus is a bit different to growing plants in the ground. Planting in pots requires a reasonably sized pot so sufficient potting mix can be added. More soil gives a greater water- and nutrient-holding capacity. The smaller the pot, the quicker the plant dries out, leading to an unthrifty tree. Nutrient leaches out more quickly so it is important to feed potted plants more regularly. From my experience, fertilising of citrus should take place in spring and summer, with the addition of chook manure and a side application of fertiliser in autumn. 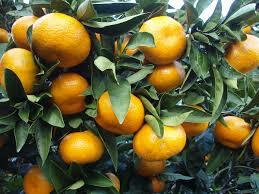 Citrus are gross nitrogen feeders so a specially formulated citrus fertiliser is most desirable. Apply at the dripline of the plant and water in well. When fertilising potted citrus use a water-soluble form so root-burn is alleviated. A side application of fish- or seaweed-based fertiliser on a regular basis outside the regular fertilising program will also benefit the plant. Citrus have several pest problems including sap-sucking pests like shield bugs, leaf miner and scale, and several fungal problems including black spot, septoria spot and citrus blast. Ask your local nursery person for advice on these problems as there are both chemical and organic forms of control for all these pests. With another autumn with us I thought it opportune to discuss one of the most popular groups of perennials—Salvia. With their extraordinary diversity of colour and habit—over 1800 species alone without the new varieties being added almost all the time—Salvias are truly a gardener’s delight, providing rich and interesting rewards for every garden. This spell-binding genus has blues to rival the colours of the ocean and sky as well as rich reds, pinks, yellows and white, and with every combination of these dominant colours. Their diversity in leaf colour and shape is second to none, with leaves that feel like velvet to long narrow leaves of varying colours. Many of the varieties are used for culinary purposes and have delightful scents that can be used to flavour foods of all kinds. 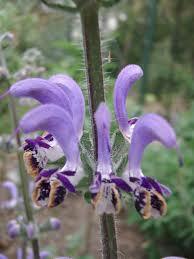 Most Salvia species are adaptable to an extensive range of soil types, from clay to open, sandy soils. Where soils might be in need of improvement it makes sense to add some organic matter like animal manures or compost. Good drainage, however, is generally advisable and without it there is a greater risk of the less hardy varieties surviving a long wet winter. In gardens where the soil is wet for long periods it is advisable to slightly raise the planting area to allow better drainage. When preparing soils for Salvia refrain from adding excess nitrogen. Too much nitrogen will give lush foliage at the expense of flowers. Soil acidity/alkalinity play no great part in the placement of the plants, although many of the species are derived from locations where limestone is dominant. Nearly all varieties prefer a full sun position with the exception of a few that will grow in and tolerate shade. Some taller varieties have a brittle branching habit and thus should be planted in a location free of strong winds. Many of the lower growing forms are excellent in a seaside garden. Like all perennials, Salvias should be pruned on a regular basis to keep the plant in a compact form and to promote several periods of flowering throughout the year. They are generally pest- and disease-free. Aphids and some powdery mildew can be a problem in the summer months. They are a great plant to grow in a container for those who have a difficult location or to brighten up an area on paving etc where other plants might have failed. Due to their ability to handle periods of dryness they are an ideal pot plant. Often overlooked these days are the extensive range of annual forms that are available to brighten up the flower garden where seasonal change is required. Reds, white, blues and purples are available and should be planted at the rear of the garden. Most of the annual forms are best planted in the warmer months, so keep an eye out for them in nurseries around mid-spring. One other thing that these beautiful plants do is to provide bees and nectar-feeding birds with nectar and pollen, so they are a great plant to place around vegetable gardens to help with pollination. 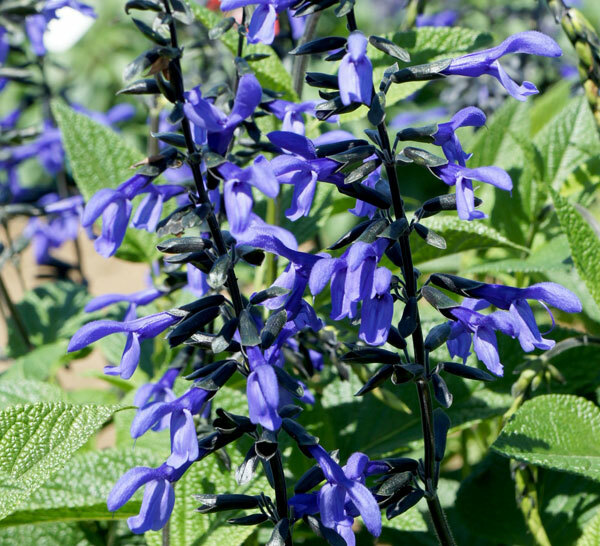 Check out your local nursery for the exciting range of perennial and annual Salvia now available and brighten up your garden with these rewarding plants. With autumn well and truly with us there are plenty of things to do with new plantings of trees, shrubs, perennials, and vegetable and flower seedlings. Autumn is the most desirable season for planting as the day temperatures are lower therefore lower transpiration rates but the soil is still warm enough to allow the roots to establish before the winter sets in. The plant will then rest through winter and when the first warm days of spring arrive the plant has already settled in and new growth will commence immediately. Being a perfect time to plant, you might consider adding some interesting new plants to your garden. 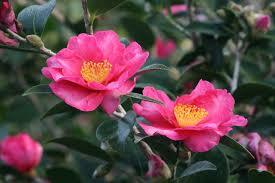 In the shrub department you cannot go past the Camellia sasanqua range. These beautiful autumn flowering plants come in several forms from tall shrubs to groundcovers. Their colours are usually soft pink and whites with some lovely crimson and red forms thrown in for good measure. They have both single and double forms and the groundcovers ‘Marge Miller’ and ‘Snow’ can be planted either as a groundcover or do very well in a pot. Use a premium potting mix if potting and fertilise regularly with a liquid or slow release Camellia/Azalea fertiliser. The taller varieties make an ideal screen planting or hedge and there are many new varieties especially developed for these purposes. They are generally pest and disease free apart form an occasional infestation of aphid, which is easily controlled with a systemic insecticide or one of the many organic controls that are making their way into nurseries. Another great addition to the garden for autumn flowering is the beautiful Japanese Windflower (Anemone hupehensis). This lovely perennial prefers a site that receives some protection from hot summer sun as any dry stress during summer will reduce the development of flowers. They come in colours of white, pink and dark pink and in single and double forms. Autumn also brings with it the commencement of plantings for the winter vegetable garden and also the autumn through to spring flower garden. The vegetables to plant now will be all the brassicas, peas, carrots, parsnips and turnips along with leafy greens like winter lettuce, spinach and so on. The list is endless. In the flower garden, varieties including pansy, viola, primula, stocks, poppies and wallflowers can also be planted. Prepare the soils for both vegetable and flower seedlings with some animal manure well forked through and water in with a combination fish and seaweed fertiliser. This will get them started well as natural plant hormones in the fertiliser will reduce transplant shock. Remember, as I mention in most articles, to mulch all your plantings with a good mulch like sugar cane or lucerne mulch. This will keep the plants moist and the weed competition down. And dead-heading perennials and roses will encourage them to have one last flower before winter. Do an autumn feed of lawns with a complete lawn food to give them a boost and to tide them over for winter. The things to do in the autumn months are endless so get out there and make a difference! With the cooler months of the year fast approaching, our gardens can become somewhat drab. Consider adding some colour to the garden—this not only makes the garden look great but also encourages us to get outside, now the heat of summer is over. There are many plants that can brighten up any garden and warm our hearts with their beauty, and good nurseries will be full of colourful plants just waiting to get out there. You can add colour in two ways: with flowering plants, and with plants that retain their leaves and are coloured other than green. I’ll start with annuals that can be planted in pots or the in the ground. These give instant colour and will last until the warmer weather arrives. Pansies, viola, primula, snapdragons and poppies are but a few that come to mind. You can plant them as immature seedlings or as plants already in flower and these give an instant effect. Planted in a full-sun position with a compost-enriched soil or a premium potting mix and fed with a liquid fertiliser, they are a simple and inexpensive way to brighten up your day. For a more permanent display try using perennials, but be aware that even though they do well in the full sun during winter, you might need to plant some under deciduous trees to give them protection from summer sun. Many perennials add colour by either flower or foliage and the foliage forms can vary from deep purple to yellow and various shades of variegation. One of my favourites is the amazing Hellebore. These beautiful plants range in colour from white to pink and purple with varieties being single or double. Nurseries specialising in this type of plant will have them in stock now. Other plants to be considered are Polemoniums for their variegated foliage, Penstemon Huskers Red for its scarlet foliage and Heuchera for their interesting range of colours. An amazing genus of plants is the Salvias. Many are winter-flowering and, with many new varieties appearing on the market, there will certainly be one or more of these that will brighten up your autumn/winter garden. If annuals and perennials don’t take your fancy, then consider shrubs that have either a variegated or coloured foliage. Variegated foliage plants add another interesting dimension to your garden as in winter many other plants nearby have lost their leaves. 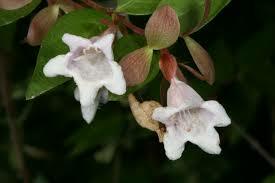 Abelia, a small shrub suited to hedging or as a single specimen plant, can add around-year interest. Two lovely forms are available at the moment, one with a green and silver variegation and the other green and gold. Both will take part shade or full sun. Other variegated plants include Euonymous, Aucuba and Metrosideros (NZ Christmas bush for the coastal garden). Single-coloured foliage plants that have standout beauty in their foliage but also the added bonus of flowers are also a great addition for the autumn/winter garden. Loropetalum with its burgundy foliage and pink flowers is a beauty. This can be hedged or used as a single specimen. Teucrium with its silver foliage and purple flowers is a good one for a coastal garden. One shouldn’t forget the amazing selection of Australian natives that flower in the winter and these beauties add colour and also supply food for nectar-feeding birds during the colder months. The plants that I have mentioned above are but a miniscule of what is available to brighten up the garden and your pots so the rest is up to you. Don’t be afraid to use combinations of plants as many annuals, perennials and shrubs work very well together. Finally, remember that plants still need water even as the days start to cool off—not as much as in the warmer months but it still must happen, particularly pots. 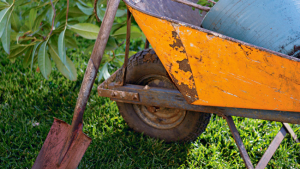 In my opinion as a horticulturist, nurseryman and gardener, mulching garden beds, whether shrub or vegetable, is one of the most beneficial tasks that you can undertake. The benefits are many, from weed suppression to moisture retention and, just as important, as an insulator against frost and heat. There are many products available and the type we use depends on several factors. Do you want the mulch to be a short or long term solution? The decision comes down to whether the garden or plant you are mulching is something like a vegetable or flower garden or a permanent shrubbery or tree planting. In the case of the flower or vegetable garden there are two methods of mulching: a soft mulch like sugar cane or straw, or shredded cow manure. In both cases these products are short term but are of great benefit to the garden. Both decompose over a short period, and through their decomposition process retain moisture around the plants and improve the structure and the texture of the soil. The long term benefits of this are an improved ability for the soil to retain moisture but, more importantly for the plant, to take up nutrient and develop a good root system which in turn helps it through periods of stress. The other forms of mulches like gravel and woodchips are more long term and should only be used on shrub beds and around trees. Wood chips, whether hardwood (Eucalyptus) or softwood (pine), also have a shelf life but their ability to retain moisture for the plants is better than no mulch. Wood chips have one issue—in their decomposition process they tie up the nitrogen available to the plant so regular supplementary fertilising is required to counter this. My favourite form of mulch is a river gravel, which is usually a by-product from sand dredging along rivers. Although some people will say that this is not that necessarily friendly for our environment, the benefit for our plants should take precedence. Gravel mulch has great benefits like not blowing away in strong winds, particularly in coastal gardens, and that it is usually a one-off application, as it doesn’t decompose like wood and straw mulches. If you live in a fire-prone area, gravel does not burn and therefore is of great benefit. It is a bit more expensive than the wood mulches but in most cases is a one off application. A minor top up in several years might be required. A few other things to consider when using mulches are that mulch can prevent light showers of rain reaching the soil surface thus robbing the plants of moisture. In dry periods it is advisable to rake back the mulch from around the plant trunk, saturate the soil and then place the mulch back. Similarly when applying fertiliser the process should be repeated. Call into your local nursery and discuss your situation with the nursery person. Undoubtedly you will be given the right information for your situation. Citrus are presently one of the most popular categories of fruit trees available in nurseries. This is mainly due to the work that has been done in recent times to provide dwarf growing forms that are more suitable to pot culture or for our ever decreasing house block sizes. We now have many varieties that are on much improved root stocks, which in turn give the plant a better ability to survive under many different climatic conditions and soil types. In growing citrus your location is very important as many are not suited to heavy frosts or cold southerly winds. Optimal temperatures for growing citrus are between 25 and 30 degrees C. When temperatures get above 38 degrees growth is inhibited, although the plant will survive up to 50 degrees. Oranges and lemons are more suited to colder parts of our area although some frost protection is required in very cold locations. Limes and cumquats require a really warm, frost-protected site. Satsuma mandarin, Meyer lemon and sour orange are more tolerant of cold and can be grown in a more open, exposed position. Locations along the coast like Narooma and Bermagui are suited to all citrus as long as they have protection from the cold southerly winds. Autumn through spring and into summer are the best times to plant citrus, with the selection of the site most important. The site should be well drained with a compost-enriched soil and a full sun position. As mentioned previously a site that has wind protection but especially south wind protection is very important. Dig a wide hole but not massively deep and add a commercial planting compost to your soil. If you have made your own compost ensure that it has broken down sufficiently to mix with your soil. Remember, don’t completely change your soil when planting, but improve the soil you have. When you backfill the hole, check to make sure that soil does not come up above the graft. Add just enough soil to cover where the soil came up to in the pot. If you don’t have sufficient room in the garden then try one of the dwarf forms. Mandarins, oranges, lemons and limes come in dwarf forms with at least two varieties per fruit available. Pot culture of citrus is a bit different to growing plants in the ground. Planting in pots requires a reasonable size pot so sufficient potting mix can be added. The more soil gives a greater water- and nutrient-holding capability. The smaller the pot the quicker the plant dries out and this leads to an unthrifty tree. Nutrient leaches out more quickly so it is important to feed the potted plants more regularly. Fertilising of citrus should take place in spring and summer with the addition of chook manure and a side application of fertiliser in autumn. 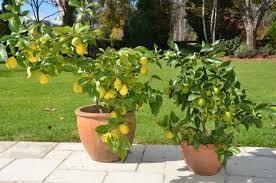 When fertilising potted citrus, use a water soluble form so root burn is alleviated. A side application of fish- or seaweed-based fertiliser on a regular basis outside the regular fertilising program will also benefit the plant. Citrus have several pest problems including sap-sucking pests like shield bugs, leaf miner and scale, and fungal problems including black spot, septoria spot and citrus blast. Ask your local nursery person for control measures to combat these problems as there are both chemical and organic forms of control for all these pests. With the ever-increasing use of our outdoor space, pots as a growing solution are becoming far more popular. So here are some hints on how to successfully manage this form of gardening. First decide what you actually want the pots and the plants to achieve. Are they to be used for growing vegetables, annual colour, perennials or shrubs? Or perhaps a screening plant to hide a shed or some unsightly part of the landscape? The pot size is absolutely the most crucial decision, as a pot too small for the plant will cause it to dry out quickly, blow over in the wind or not contain sufficient nutrient to keep the plant healthy. Generally, glazed pots are the best as there are many colours that suit the colour scheme of your home and these pots have a better moisture holding capability. Terracotta pots are very stylish but tend to dry, out so, if you use them, seal the inside of the pot with a terracotta sealant. If you want to gradually enlarge to the next pot size as the plant grows, use a straight sided or V-shaped pot so the plant can be easily removed. A plant in a belly-shaped pot is nigh on impossible to repot without causing serious disturbance to the root system. When selecting the plant to be potted, consider the eventual size of the plant. Remember that the larger the plant grows, the larger the pot should be. A plant that is to be used for screening should be in a pot that will also act as an anchor in a windy site. Too small a pot will just blow over and in most cases break. If you are growing annuals, herbs or vegetables, a shallow pot will suffice as they are all generally shallow rooting and do not need a great depth of soil. Use a premium potting mix with some slow release fertiliser and include some water storage crystals. There are many types of mixes out there and I can guarantee that the cheaper the mix, the lesser the quality. Cheaper mixes are basically just pine bark and if you are growing vegetables and annual flowers you will need to fertilise and water more often as these mixes do not have any moisture- or nutrient-holding capabilities. The cheaper mixes will be of no benefit to the plants after a season or two. Watering and fertilising is of an absolute importance. Vegetable and annual flowers will need watering several times a week and fertilising every ten days or so with a liquid fertiliser like a fish-or seaweed-based fertiliser. Shrubs and longer living plants also need watering and fertilising on a regular basis although, with the fertilising, add a specific slow-release fertiliser for the particular group of plants you have used. Do this three or four times a year, and add liquid food on a monthly basis. During the cooler months you can cut back as the plants are not growing. Just a few other things to remember: check from time to time that the drainage holes haven’t become blocked by roots, rotate the pots to get an even, all-over growth, and prune when necessary. Spring has arrived and with it the start of the gardening year. New growth appears on deciduous plants, perennials wake after their enforced winter hibernation and bulbs pop up everywhere. This month commences with many tasks in the garden including the preparation and planting of the spring vegetable garden, planting of flowering annuals and the completion of late winter and early spring chores before too much new growth on plants appears. Pruning of deciduous fruit trees and roses should be well completed. Winter spraying must have been completed. Please remember that if your fruit trees have broken bud and are flowering, it is too late to use the stronger winter sprays as you risk blossom burn, which in turn leads to poor or no fruit development. New growth on roses and fruit trees is a delicious target for aphids so keep an eye out for them. Spray with an organic insecticide or a synthetic pyrethroid like Confidor and this will halt their progress. These will not affect the blossom if you have some late blossom still on the plant. The vegetable garden should be getting the finishing touches prior to planting. Initially the garden should be dug over to spade depth and a spreading of lime (500g per square metre) all over applied. After a week add some well-rotted cow or poultry manure and fork it well into the soil. 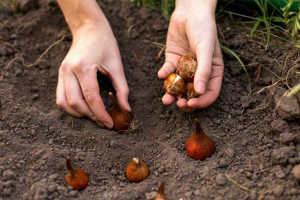 You can then get on with planting as the soils are now warm enough for new seedlings. There are some plants that might need some protection from that sneaky late frost. Tomatoes, beans, capsicum, eggplant and zucchini are a few that have very little tolerance to colder temperatures, so a planting of these closer to the beginning of November is more advisable. My old Dad used to say that you should dig the garden over on that special day in November. Once you have listened to “the Cup” go out and plant your tomatoes. A good bit of advice. When growing vegetables it is important to practice crop rotation. By this I mean don’t plant the vegetable in the same position as you had it last season. This applies particularly to tomatoes and potatoes as these two groups of plants are in the same family and any pest or disease lying dormant in the soil could cause problems with the new crop this season. One major factor is to only grow as many vegetables as your family requires. It’s best to avoid growing crops where the bulk of the harvest comes all at once unless you can put the extras in the freezer for the out-of-season periods. It’s important to remember that there are three main categories of herbs. There are moisture lovers like mints and coriander, the dry garden herbs like parsley, sage, rosemary and the thymes, and the higher nutrient leafy forms like the perpetual lettuce, spinach and more of the leafy herbs. Finally, remember the key ingredients for good vegetables are full sun, good drainage and good nutrients. The genus of Grevillea has plants that suit a wide range of uses from groundcover to screening and from bird attraction to animal deterrent (prickly forms). Much work has been done in the breeding of new varieties by hybridisation of certain parent plants that have a particular attribute like size, flower type, drought tolerance and so on. By crossing two plants with different special features a new variety is developed that has all the good features of its parents thus giving us a plant of exceptional value. This hybridisation can be done in a nursery situation where a nurseryman wishes to develop a new plant or can be done by nature itself wherein two different species grown side by side are cross-pollinated and a seedling is developed nearby and then come across by a human who then grows it on, to produce a new variety. In recent years a new growing method has come into place wherein a beautiful species, say from Western Australia, has been grafted onto an east coast species to give that plant the ability to grow outside its normal growing area. In many cases the understock used will be Grevillea robusta (Silky Oak) and this allows the plant to handle conditions like clay soils and humidity experienced on the east coast. A lovely example of this is Grevillea plurijuga (Purple Haze) which has its origin in Western Australia. Many groundcover forms have also been grafted onto what is called a high graft, on a standard of about one to one and a half metres in height, similar to a standard rose. These are great in a pot or as a special feature in the garden. Speaking of pots, Grevillea are a great pot plant. Care must be taken in using a variety that doesn’t need a lot of pruning. The variety I have used is ‘Peaches and Cream’. This is one of the most prolific flowering and all-round great Grevilleas that has been developed in recent years. Not only is it good for pots and bird attraction but will grow in a garden from first line coastal to inland gardens. In using Grevillea in pots it is advisable to use a native or premium potting mix and then to fertilise with a slow release or liquid native plant food. 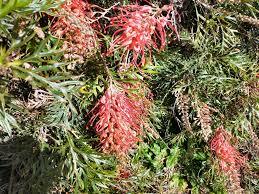 Grevillea will grow in a wide range of soils from loam through clay but are not generally fond of a sandy soil. 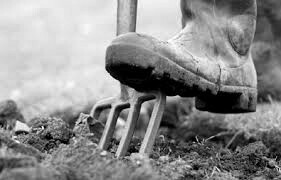 In preparation for planting, dig a wide hole, but not too deep. Depending on the amount of clay, some organic planting mix could be mixed with your existing soil to give the plant a good start. Water in with a combination seaweed and fish emulsion fertiliser. These are not too strong as an initial fertiliser and have a natural growth stimulant to help in establishment. Fertilise from that point on at regular intervals throughout the year, except winter, with a native plant food. There are very few diseases that can cause problems with Grevillea and a trip to the local nursery with a sample of the problem will usually solve it quickly. Prune regularly to keep them in shape and promote new flowering wood. Don’t be afraid to cut them back hard. They will thrive from this. With winter well and truly here and with those cold and blustery winds that seem to come directly off the snow chilling us to the bone, what better time to sit by the fire and do some planning for the upcoming warmer months in the garden. This month and next I will look at some individual categories of garden plants that not only add beauty to the garden but also can be effective for a wide range of other purposes. Ground cover plants come in many forms and categories from conifers to Australian natives to perennials and non-Australian plants. Many are absolute ground huggers and others can reach 50–70cm high but can be as wide as 3–4m. To elaborate on these we will start with first line coastal. Many of the plants that suit this particular situation are Australian natives and it is well worth mentioning that a stroll along coastal gardens and natural areas will soon give you an indication as to what species are handling this difficult growing area. Species such as Carpobrotus (an Australian native succulent) are very good for dune stabilisation along with groundcover Banksia and Westringea varieties. Myoporum and Hakea both have groundcover varieties. A good non-Australian plant is the Shore juniper (Juniperus conferta) that will mat well and stabilise sandy soils. It is important to remember that soils along the coastline can vary widely from clay/shale to very poor sandy soils. In these cases it is also a good idea to add some organic matter to your soil to improve the chances of the new plantings to establish. Moving away from direct coastal we then move into more protected locations with heavier soils and not so much wind. Again some organic material mixed into the planting hole will help these plants establish. In open sunny positions in these locations the list is endless. Australian natives include Grevillea, Leptospermum, Callistemon and Banksia with many others that are softer perennial types including Scaevola and Brachyscome. Non-Australian plants include groundcover Camellia (Marge Miller and Snow), Carpet roses, Cotoneaster dammeri, Convolvulus and the list goes on. Shaded gardens are always a bit of a problem but there are many plants that can be used in combinations with perennials, including Camellias, Chinese star Jasmine (often used as a climber) and the very beautiful Gumpo Azaleas. Space does not allow me to mention the many others that are available. Herbs are the most likely category of groundcovers that do not get much of a mention but there are many of great benefit. These can be used to cover paths within the herb and vegetable garden or used to cover a retained area within the garden. Several varieties of Thyme are suitable for walking on and prostrate Rosemary also falls into this category. The ground preparation for groundcover plants is the same as for all other plants, with the inclusion of some compost mixed with the existing soil to give the plants a good start. There is a common mistaken belief that ground cover plants will provide weed suppression. There might be some weed suppression but generally weeds will still grow through the groundcovers and will be very hard to remove after the plants have established. Ideally, the best method is to lay down several layers of moist newspaper and cover with moisture-retentive mulch prior to planting and then pull paper and mulch aside sufficiently to make the planting hole. Plant the plants and then water in and pull paper and mulch back around the plant. Over the period the newspaper takes to decompose, the weeds would have most likely died. Some careful hand weeding and spot spraying after that will ensure the garden stays weed free. It is important to remember that during the course of their life, plants will have failures and successes. If you have tried a particular plant in your garden, don’t give up if that particular variety has not done as well as you expect. Many factors can be at play here including soil types, moisture regimes and sun or shade. Sometimes it will take a couple of tries to get a success and things will not look back after that. Winter is well and truly here and the time is right to catch up with pruning of roses, fruit trees and many other deciduous plants in the garden that need to be done to form new wood for future flowers and fruiting. It is important to remember that pruning too early while the sa p is still flowing can cause the plant to stress with “bleeding” and also allows disease to enter these wounds. Also pruning roses too early will encourage them to shoot with these shoots being possibly burnt off with a heavy frost. Roses should be pruned reasonably hard, as the more new growth that is encouraged the more blooms will appear in late spring. 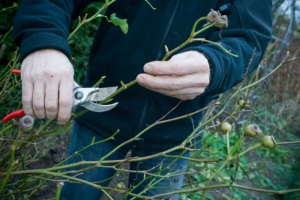 If you are unsure of the severity of pruning then these few tips will help. Initially remove all dead or damaged wood. Remove any branches that are crossing over another branch or are growing into the centre of the bush. The idea is to keep the centre of the bush open in a vase shape to allow for better air circulation. This will decrease the possibility of fungal diseases when the plants come into leaf again in spring. Reduce all the other growth by as much as half, remembering to ensure you have live buds below the cut and the upper-most bud is pointing away from the centre of the plant, basically pointing in the direction you want the new growth to point. 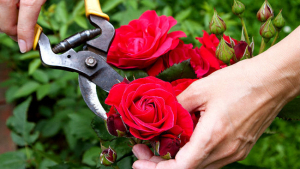 An important fact to remember when doing your roses is not to prune those that have only one flowering period in spring. This usually means many of the old fashioned forms and several of the climbing varieties. These roses flower on the current season growth and if pruned in winter there will be no flowers. Pruning of these roses takes place in late spring after they have flowered. Once all the roses and trees have been pruned complete a spray of winter insecticide and fungicide to remove any over-wintering insect pests and fungal problems. Pruning of hydrangeas should also now take place and a similar method of pruning to roses is recommended. Hydrangeas flower on growth that has been made in spring on new season wood, so the more that this is encouraged the more flowers you will have. Still on the theme of pruning it should be well remembered that not every flowering tree or shrub in the garden needs to be pruned in winter. I have seen many spring flowering plants heavily pruned in winter and then no blossom appears in spring. Spring flowering trees and shrubs develop their flowering buds in late summer and autumn and if these plants require pruning, do it in late spring after flowering. They then have all the following seasons to develop new flowering wood. Remember to ensure all your pruning tools are well sharpened and clean before you start. Cleaning the cutting tools between plants with a diluted Dettol or similar will decrease the spread of infection from one plant to another. With the ever-increasing demand for food to be labelled with the origin of the supply, one sure method of knowing where it is grown is to grow your own. 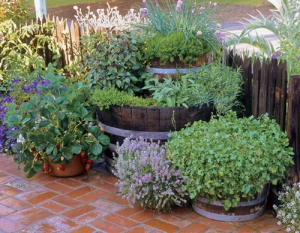 A great way of doing this, with the bonus of trying new and exciting taste sensations, is to use the amazing number of herbs that can be grown easily in our own backyards. Herbs are tolerant of a wide range of growing conditions and they grow well with very little maintenance. However, for the best results it is best to categorise them into four groups. If you follow the growing hints for each group, your herbs should be healthy, flavoursome and fragrant. Initially though, the preparation of the site is most important with a light, well-drained soil and generally in full sun. Some herbs prefer a light shade. Before planting, dig the soil to about 25cm deep. If the soil lacks any decent humus it is a good idea to add some well-rotted cow or chicken manure and either some blood and bone or a complete fertiliser. You can also add some garden lime at the rate of half a cup per square metre. Fork all this together and probably let it rest for a week to ten days. those that will Suit Most Conditions. The Mediterranean group includes thymes, sages, lavender, marjoram, rosemary, french tarragon, lemon verbena and several others. These herbs will handle fairly low soil fertility and higher lime or alkaline soils. They require very good drainage hence lower water requirements. The next category, High Summer Moisture Requirers, includes the mints, water cress, lemon balm, lemon grass, sorrel, cardamom and also several others. these herbs prefer a soil with high nutrient and will not perform well if allowed to dry out. Saying that though, the soil must be well drained and not water-logged—apart from the mints that will perform in wet conditions. 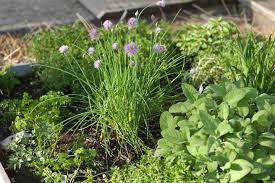 Thirdly, the Vegetable Culture Herbs include basil, chives, parsley, rocket, coriander, dill, fennel and several others. These herbs again like high soil nutrition with the focus being on high nitrogen rates. They also prefer good summer moisture. The last group are the Suit Most Conditions herbs. These include borage, feverfew, tansy, winter tarragon and aloe vera, to name a few. These will handle the conditions of all the above. Therefore, when planning your herb garden it is important to divide your garden into the four categories mentioned. This will make it much easier to maintain and ensure that each herb gets the best conditions for healthy growth. A variety of foliage types within each group will also make the garden visibly more appealing. Have it close to the kitchen so quick access is available. Use it regularly so fresh material is always coming on. Replace plants like parsley every two years as they often can go to seed. Herbs come in perennial and annual forms with the perennial types usually dying down over winter. As these die back give them a cut back, and in early spring spread a handful of complete fertiliser around them with a few handfuls of composted cow manure. This will get them off to a good start. Annual forms will require replacement every year. For those of you who have difficulty in providing a plot for your herbs, remember that they do very well in containers. Just follow the guidelines above and keep like requiring plants together in the same container. Mints can become invasive and are best grown in a pot under the backyard tap. Remember, always use a premium potting mix in the potting process and regularly feed with a seaweed/fish emulsion fertiliser. As we head into the cooler months of the year we should not forget that the garden can be as beautiful in the throes of late autumn/winter as during the warmer seasons. The cooler months bring with them the interesting shapes and bark colours of the bare trees as they drop their autumn leaves and the first frosts cloak them in a glistening white. What better time to see the amazing colours of the bark of Crepe Myrtle? This beautiful, small tree not only has amazing flowers in mid-autumn but is then followed by glorious coloured leaves as they fall to reveal the greyish pink bark, a standout feature of this plant. Another great tree for winter colour is the Golden Ash, which after losing its leaves is left with lovely yellow branches that give an eerie appearance through the frost and fogs of winter. The winter garden brings with it the flowering of many plants including the glorious Hellebore. These beautiful perennials thrive under deciduous trees as the trees protect them from the summer heat, but as the leaves fall they are exposed to the winter sun where they throw out clusters of softly coloured flowers. There has been an amazing amount of breeding of these plants recently, bringing to the gardening world many forms and colours. 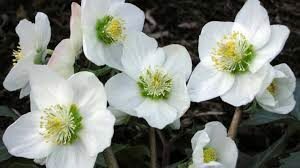 Hellebores come in single and double forms and in a wide range of colours from white, through shades of pink and burgundy, to greys and yellow. Autumn is probably the best time to upgrade plantings in the garden as evaporation and transpiration rates are low, thus giving the new plants an easy start. Deciduous bare-rooted trees and shrubs will start to appear in nurseries over the next few weeks so get in and get them while they are nice and fresh. If they have been in the nursery for too long it’s possible that they might have been allowed to dry out, therefore leading to root damage. Shrivelled stems and branches are a good sign that they have dried out, diminishing their chance of a successful planting. Moving along from plants that make our late autumn gardens look great, we shouldn’t forget about the general maintenance of the garden. I often hear comment made that plants do not require a lot of watering in autumn. People say that watering isn’t required because when they go outside early in the morning there’s dew on the ground and this should keep their plants going. This is completely wrong as this moisture is very soon evaporated by the sun and is not available to the plants. So unless we have had regular rainfall, don’t forget to give things a drink. Late autumn is also the last opportunity to do some late fertilising of both lawns and gardens to give the plants a last feed before it’s too cold for them to take up the nutrient. A complete NPK lawn food will keep lawns looking nice and green until the frost start to brown them off. A couple of handfuls of an organic fertiliser around trees and shrubs will also help them through until spring. Finally the flower and vegetable gardens should be well and truly planted with winter/spring plants. Pansies, viola, primula, wallflower, poppies and stocks are just some of the flowers that can go in now. Cabbage, cauliflower, broad beans, onions and carrots are a few of the vegetables that could be given a go. Watch out for the cabbage moth as they can do some early damage on cabbages and cauliflowers etc. There are some very good “safe” deterrents around to combat them, eg Dipel. Well, here we are in another season, and autumn brings with it the start of the cooler days and nights and the perfect time for gardening. There will be plenty of things to do with new planting, whether tree, shrub, perennial or vegetable and flower seedlings. Being a nurseryman, I will say any time is good, as long as you maintain the plants with mulch and water if planting in the warmer months. Generally, though, autumn is the most desirable season, as the day temperatures are lower, therefore lower transpiration rates, and the soil is still warm enough to allow the roots to establish before the winter sets in. The plant will then rest through the winter and when the first warm days of spring arrive, the plant has already settled in and new growth will commence immediately. Autumn being a perfect time to plant, consideration should be given to adding some interesting new plants to your garden. 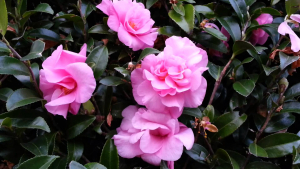 In the shrub department you cannot go past the Camellia Sasanqua range. These beautiful autumn-flowering plants come in several forms, from tall shrubs to groundcovers. Their colours are usually soft pinks and whites, with some lovely crimson and red forms thrown in for good measure. They have both single and double forms and the groundcovers, MargeMiller and Snow,can be planted either as a groundcover or do very well in a pot. Use a premium potting mix if potting and fertilise regularly with a liquid or slow release camellia/azalea fertiliser. The taller varieties make an ideal screen-planting or hedge and will tolerate a full sun position. They are generally pest and disease free apart from an occasional infestation of aphid that is easily controlled with a systemic synthetic insecticide. Another great addition to the garden for autumn flowering is the beautiful Japanese windflower (Anemone Hupehensis). This lovely perennial prefers a site that receives some protection from the hot summer sun as any dry stress during summer will reduce the development of flowers. They come in colours of white, pink and dark pink and in single and double forms. The vegetables to plant now will be all the cabbages and cauliflowers, peas, carrots, parsnips and turnips along with leafy greens like winter lettuce, spinach and so on. The list is endless. In the flower garden, varieties including pansy, viola, primula, stocks, poppies and wallflowers to name a few can also be planted. Prepare the soils for both vegetable and flower seedlings with some animal manure, well forked through and watered in with a combination fish and seaweed fertiliser. This will get them started well, as natural plant hormones in the fertiliser will reduce transplant shock. Remember, as I always mention in most articles, to mulch all of your plantings with a good mulch like sugar cane or lucerne mulch. This will keep the plants moist and the weed competition down. A few other jobs in the garden like dead-heading perennials and roses will encourage them to have one last flower before winter. Do an autumn feed of lawns with a complete lawn food to give them a boost and to tide them over for winter. Also, as the days cool, keep an eye out for a late infestation of aphid. The things to do in the autumn months are endless, so get out there and make a difference. Summer brings with it the usual tasks, and although these tasks can seem tiresome they are most essential in the overall upkeep of our gardens. Watering is without a doubt the top of the list. 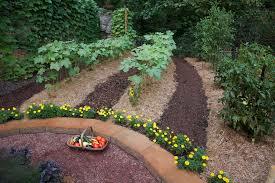 Garden beds require a good soaking at least every seven to ten days using a sprinkler and not a hand held spray. Watering with a hand held spray is basically just a waste of this valuable resource; invariably the surface just gets a wetting and water does not reach the feeder roots of the plants thus encouraging a shallow root system. In periods of extremely dry conditions, plants with shallow roots dry out very quickly and place the plant under stress even leading to death. Similarly with lawn watering, it is best to deep water a couple of times per week to encourage deep rooting of the grass. This again will help to prevent the grass drying out. 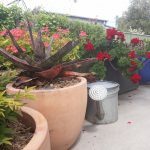 As I write this article, the summer so far has been extremely dry and much care should be taken in giving the plants a drink before they start to stress. I have heard many say how good the rain was in recent times but unless we have had at least a day of good soaking rain then generally it is not enough. A light, one-millimetre shower of rain does nothing for the garden but wash the dust off the plants. Maintenance of plants is another task that you can take care of during the mid-summer period. Dead-head roses and give them a light application of rose food. This will encourage new flowering wood for an autumn flush and also assist in the prevention of summer pests and diseases. You can take care of diseases like black spot and powdery mildew with a rose fungicide and control insect pests like aphid with a systemic insect spray. Practices like watering roses in the early morning and placing the sprinkler so there’s no overhead watering will also help prevent fungal diseases. You can summer-prune fruit trees after the crop has finished. Thinning out a lot of the new growth made over the seasons since the major prune in winter will allow the tree to strengthen branches, giving the tree a better structure. Plant hygiene is also crucial at this time. Collect and dispose of all spoilt fruit from under the trees and diseased leaves from under the rose bushes. Perennial plants can also do with a tidy up, removing spent flower heads and any unsightly foliage that might have died. This will encourage another flush of flowers to carry through until early winter. You can start setting up the vegetable garden for the autumn crop now. 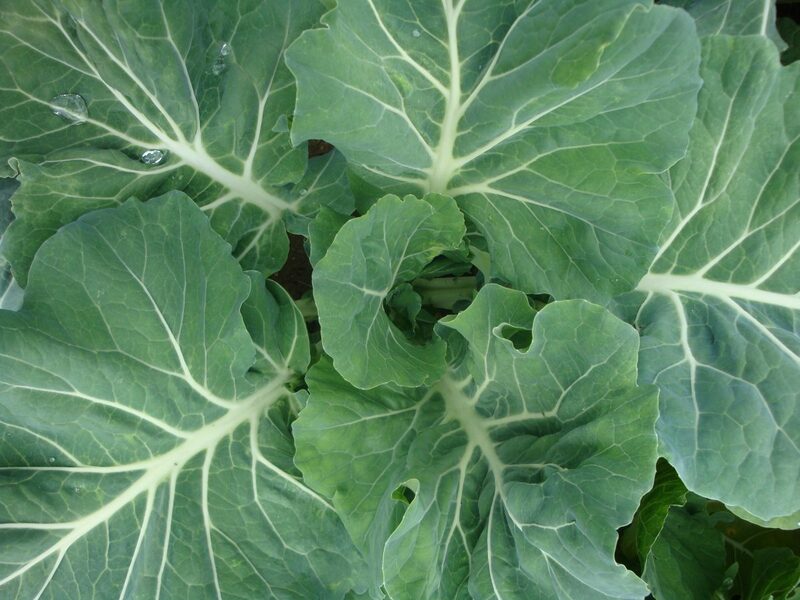 Most of the summer crops will be finishing off so it’s a good time to plan and prepare for the cauliflowers, broccoli, cabbages, onions and the like that prefer the cooler months that are just around the corner. Dig over the beds and add some animal manure and lime and let things rest for a few weeks. By that time the weather will have cooled and the autumn seedlings can go in. Remember to practise crop rotation, not following a like crop with another previously planted. Good luck with all of the above and bring on the cooler months! Well, another year is all but over and the following summer months are a critical time to get our gardens through the hot and drier months. Summer brings with it the usual tasks and although they can seem tiresome they are most essential in the overall upkeep of our gardens. Watering is without a doubt at the top of the list. Garden beds require a good soaking at least every seven to ten days using a sprinkler and not a hand-held spray. Watering with a hand-held spray is basically just a waste of this valuable resource. Invariably the surface just gets a wetting and water does not reach the feeder roots of the plants, thus encouraging a shallow root system. In periods of extremely dry conditions, plants with shallow roots dry out very quickly and place the plant under stress often leading to death. Similarly with lawn watering, it is best to deep water a couple of times per week to encourage deep rooting of the grass. This again will assist in preventing the grass drying out. Lift the mower up a couple of notches as more leaf will help the plant through hot days. At the writing of this article we have had very little rain and although the grass and paddocks look green it is only surface moisture. Much care should be taken in giving the plants a deep watering before they start to stress. Many of my customers have come in and made comments on how good the rain was the previous day. I usually make a comment that I must have been on another planet at the time as I couldn’t recall the last good rain. A light one-millimetre shower of rain does very little for the garden other than to wash the dust off the plants. Don’t be fooled as to the benefit to the garden of these light showers. They are usually wasted in wetting the mulch but don’t get through to the root zone of the plants. Maintenance of plants is another task that can be taken care of during the mid-summer period. Keep an eye out for aphid infestation on roses and new growth on other plants as the aphids like the warmer weather and can do some serious damage to plants. Use a complete insecticide and fungicidal spray to control any pest on the roses including black spot and powdery mildew. Practices like watering roses in the early morning and placing the sprinkler in such a position to prevent overhead watering will also assist in the prevention of fungal diseases. Spring flowering perennials can also do with a tidy-up during this month, removing spent flower heads and any unsightly foliage that might have died. This will encourage another flush of flowers and carry through until autumn. A repeat planting of summer salad vegetables can take place assuring you of a continual supply of delicious food. Remember to water your tomatoes at root level and not overhead. This will also prevent disease activity. Using a fertiliser high in potassium will enhance flowering therefore more fruit. Finally, I wish you all a safe and happy Christmas and look forward to providing more great gardening tips in the new year. Our nursery is now closed at Tilba Tilba but will reopen in Central Tilba sometime towards the end of February. See you all then. Without any doubt, the practice of mulching is as important a job in the garden as anything else that might be done. With summer on the way it is a great time to top up or apply new mulch that will keep the soil at an optimum moisture level. By adding mulch before the dry weather commences you will capture the moisture in the soil before it is lost to evaporation. There are many products available for us to use and the type we use depends on several factors. Do you want the mulch to be a short or a long term solution? The decision comes down to whether the garden or plants you are mulching is something like a vegetable or flower garden or a permanent shrubbery or tree planting. 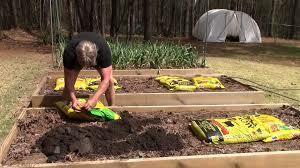 In the case of the flower or vegetable garden there are basically two methods of mulching. 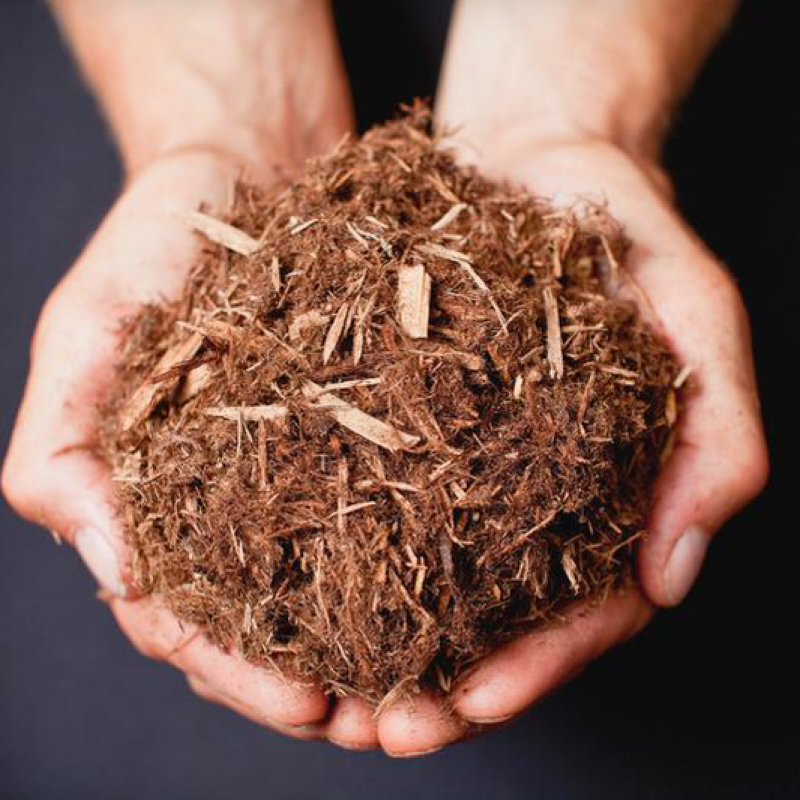 One is to use a soft mulch like sugar cane or straw and the other shredded cow manure. In both cases these products are short term but are of great benefit to the garden. Both decompose over a short period and through this decomposition process retain moisture around the plants and improve the structure and the texture of the soil. The long term benefits of this are an improved ability for the soil to retain moisture but more importantly for the plant to take up nutrient and develop a good root system which in turn helps it through periods of stress and the like. The other forms of mulches like gravel and woodchips are more long term and should only be used on shrub beds and around trees. Wood chips whether hardwood (Eucalyptus) or softwood (Pine) also have a ‘shelf” life but their ability to retain moisture for the plants is better than no mulch. Wood chips have one issue and that is that in their decomposition process they tie up the nitrogen available to the plant so regular supplementary fertilising is required to counter this. 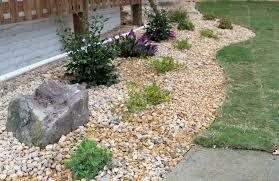 My favourite form of mulch is a river gravel, which is usually a bi-product from sand dredging along rivers. Although some people will say that this is not that necessarily environment friendly, one must weigh up the other side of the coin and that is the removal of trees for wood mulch. Gravel mulch has great benefits like not blowing away in strong winds particularly in coastal gardens and the fact that it is usually a one off application, as it doesn’t decompose like wood and straw mulches. It doesn’t burn either for those of us with a bush garden. A few other things to consider when using mulches are that mulch can prevent light showers of rain reaching the soil surface thus robbing the plants of moisture. In dry periods it is advisable to rake back the mulch from around the close proximity to the plant trunk and saturate the soil and then place the mulch back around the plant. Similarly when applying fertiliser the process should be repeated. 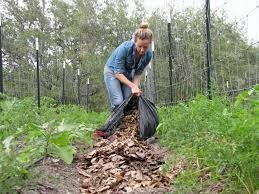 Mulching generally overall is of great benefit to the garden. Whether moisture retention in warmer months or cold protection for roots in colder month the process of mulching is a very important part of everyday gardening. With summer heading our way I thought it timely to once again talk about shade trees. Trees are probably the most important component of the landscape as they provide protection from the elements, add structure to a garden and provide habitat for wildlife. Trees come in many shapes and forms whether evergreen or deciduous, short or tall and narrow and wide. Careful consideration should be taken when selecting a tree for the location that is proposed, as trees are there for a long time. It is most important when deciding whether to use a tree in a particular location, to look at a number of issues before the final selection is made. Firstly, what do you require the tree to do? It can be to create shade for a particular style of garden that is shade in the summer and sun in the winter. It could be to screen out an eyesore in another location, or a tree to hang a swing off and the list goes on. Providing shade in a garden to protect the western side of the home from hot summer sun is a very important consideration. 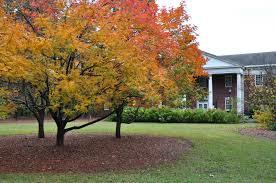 A large deciduous tree can reduce the inside temperature of a home by several degrees in the summer. In the winter sun is allowed to warm the home when the tree is dormant. Consider though, the eventual size of the tree, so it doesn’t interfere with the home when fully mature. Plan for the tree to be one and a half times the distance of the eventual radius of the tree, from the roofline of the home. Consideration of utility services like sewerage, water and power lines is most important. Although I am a great lover of trees I firmly believe that a lot of our beautiful Australian native trees like Eucalyptus trees, are totally misused in the landscape. Some of these trees can grow to a massive size and can be fairly unstable in extreme weather conditions and therefore should be used wisely in the landscape. Thankfully the horticultural industry in recent years has developed a range of smaller mallee type trees and small grafted species that are fabulous for the home garden situation. After the decision has been made to plant a tree in the garden the decision then is to the species. There are many new varieties that take into consideration small urban and town blocks and trees that cause very little problems to the gardener. Some of my favourites include a number of varieties of ornamental pears, birches, pistacia and crab apples to name just a few. Luckily all these trees are available all year around either open rooted in winter or containered in the warmer months. Planting at anytime of the year is alright as long as in the height of the warmer months, adequate water is applied to reduce transplant stress. Talk to you friends about their experiences with trees, take a drive around the local community and observe what others have done or most importantly talk to your local nursery person for their advice. Well here we are with winter nearly over and spring just around the corner and with it the start of the gardening year. New growth appears on deciduous plants, perennials wake after hibernation and bulbs pop up everywhere as new life begins. The next couple of months involves many tasks in the garden including the preparation and planting of the spring vegetable garden, planting of flowering annuals and the completion of late winter and early spring chores that need finalising before too much new growth appears. Pruning of deciduous fruit trees and roses should be close to being completed. Winter spraying must have been completed and if not just check that the buds are showing a slight colour and have not burst. If they have burst then you have missed the boat and any spraying with a winter spray coud burn the blossom leading to no or very little fruit set. New growth on roses and fruit trees are a delicious target for aphids so keep an eye out for them. Spray with an organic insecticide or a synthetic pyrethroid like Confidor and this will halt their progress. The vegetable garden should be getting the finishing touches prior to planting. Initially the garden should be dug over to spade depth and a spreading of lime (500gms per square meter) all over applied. Some well rotted cow or poultry manure can be added and forked in. If all this preparation sounds too much it should be remembered that a fast growing vegetable is a delicious vegetable. Plants that grow slowly are usually bitter and poor performers with small fruit or reduced crops. One major thing is to only grow as many vegetables as your family requires. It ‘s best to avoid growing crops where the bulk of the harvest comes all at once unless you can put the extras in the freezer for the out of season periods. Another trick is to go for quick turnover vegetables that can be picked and replaced regularly like lettuce, Asian greens, beans and spring onions. Plant taller vegetables like corn and tomatoes on the side of the garden that is less likely to shade the rest of the garden. For more permantent kitchen crops like herbs it is important to remember that there are three main categories of herbs. 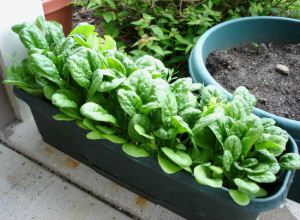 There are moisture lovers like mints and coriander, the dry garden herbs like parsley, sage, rosemary and the thymes and the higher nutrient leafy forms like the perpetual lettuce, spinach and more of the leafy herbs. This month will see the last chance to plant bare root fruit trees and roses and as I have said many times it absolutely important you pay particular attention to the condition of the plants you are about to purchase. Poorly stored plants in retail situations can allow the root systems to dry out and if this has happened the chance of the plant failing to re shoot is very high. Money ill spent. Look for plants that show no signs of the bark shrivelling or the roots very dry. If there is any indication of this, leave the plants alone. No matter what the discounted price might be they will be a failure. Ensure when planting these new plants, to prepare the soil well and water in. Anyway, now you have all the information you had better get out and get on with it. Till next time, happy planting. During the cooler months of the year leading into spring our gardens can become somewhat drab and uninteresting. Consideration to adding some colour to the garden not only makes the garden look great, but lifts our spirits on the cold damp months of winter. Colour can be added by the use of flowering plants or by plants that retain their leaves and have a colour other than green. Start with annuals that can be either planted in pots or in the ground, these give instant colour and will last until the warmer weather arrives when we plant summer annuals that can stand the warmer temperatures. Pansies, viola, primula, snapdragons and poppies are but a few that come to mind. Planted in a full sun position with a compost enriched soil and fed with a liquid fertiliser they are a simple and inexpensive way to brighten up your day. For a more permanent display try using perennials. One important factor to remember with perennials is that even though they do well in the full sun during winter, some might need to be planted under deciduous trees to give them protection from summer sun. Many perennials add colour by either flower or foliage and the foliage forms can vary from deep purple to yellow and various shades of variegation. 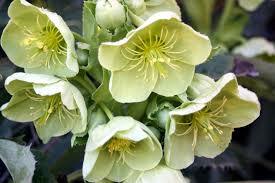 One of my favourites are the amazing Hellebore. These beautiful plants range in colour from white to pink and purple with varieties being single or double. Other plants to be considered are Polemoniums for their variegated foliage, Penstemon Huskers Red for its scarlet foliage and Heuchera for their interesting range of foliage colours. If annuals and perennials don’t take your fancy then consider shrubs that have either a variegated or coloured foliage. Many variegated foliaged plants add another interesting dimension to your garden as their standout beauty in winter is highlighted by the fact that many other plants nearby have lost their leaves. Abelia, a small shrub suited to either hedging or as a single specimen plant is a great addition to any garden. Two lovely forms are available at the moment, one with a green and silver variegation and the other green and gold. These two will take part shade or full sun. Other variegated plants include Euonymous, Aucuba and Metrosideros (NZ Christmas bush for the coastal garden). The last but not least, are single coloured foliage plants that have standout beauty in their foliage but also the added bonus of flowers. Loropetalum with its burgundy foliage and pink flowers is a beauty. There is also a white flowering form with green foliage and both can be hedged or used as a single garden specimen. Teucrium with its silver foliage and purple flowers is a good one for a coastal garden. One shouldn’t forget the amazing assortment of Australian native plants that winter flower including Philotheca (Eriostemon) varieties of Grevillea, Callistemon and Leptospermum just to name a few. Moving along to tasks in the garden as a follow up to last months’ advice, July is a great time to finish off the winter pruning of fruit trees, roses and perennials. Perennials can be mulched with some straw to protect any new shoots that might try and get an early start before the real cold weather is over. Complete winter spraying of fruit trees and roses with a winter oil and fungicide. Finally, for this month remember that plants still need water even in winter. It doesn’t have to happen as much as in the drier warmer months but it still must happen, particularly pots. Well here we are well into another winter and the time is right to catch up with many tasks in the garden that need to be done to rejuvenate plants and attend to jobs that we missed during the warmer months. During this month it is a good time to commence pruning in the rose garden and orchard as most of these plants will now be dormant. Up until now, with the unseasonal warm autumn weather, it has been a bit early to prune with the sap in the plants still running. Pruning roses before they are totally dormant will encourage them to shoot, with these shoots being damaged by frost. Remove any branches that are crossing over another branch or are growing into the centre of the bush. The idea is to keep the centre of the bush open, in a vase shape, to allow for better air circulation. This will decrease the possibility of fungal diseases when the plants come into leaf again in spring. An important fact to remember when doing your roses is not to prune the bushes that have only one flowering period in spring. These roses flower on the current season’s growth and if pruned in winter there will be no flowers. Pruning of these roses takes place in late spring after they have flowered. This applies to many old fashioned or climbing roses. The pruning of deciduous fruit trees is a bit more complicated and if you are unsure of the technique I suggest you contact a professional horticulturist for some help. Fruit trees develop fruit buds on different types of wood. It is important to know the difference so you don’t cut off established fruiting spurs, particularly on apples and pears. Pruning of hydrangeas should also now take place and a similar method of pruning to roses is recommended. Hydrangeas flower on growth that has been made in spring, on new season wood, so the more that this is encouraged the more flowers you will have. Keep an eye out in nurseries for winter flowering perennials. 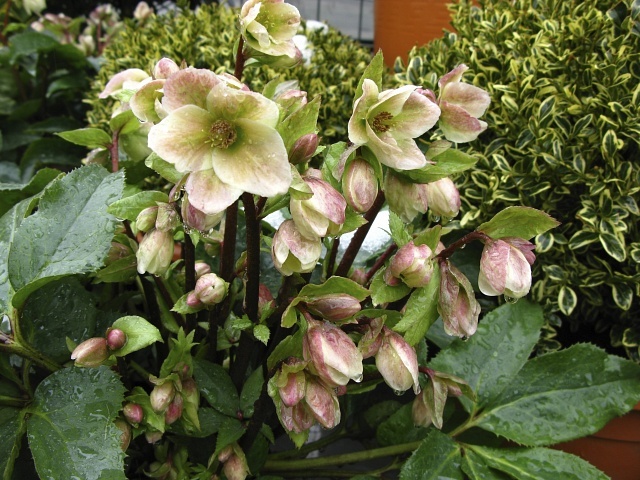 Hellebores, salvia, agastache and many others are now available. These will add a bit of colour to what can be a drab period of the year of our gardens. Still on the theme of pruning it should be well remembered that not every flowering tree or shrub in the garden needs to be pruned in winter. I have seen many spring flowering plants heavily pruned in winter and then no blossom appear in spring. Spring flowering trees and shrubs develop their flowering buds in late summer and autumn and if these plants require pruning, do it in late spring after flowering. They then have all the following seasons to develop new flowering wood. 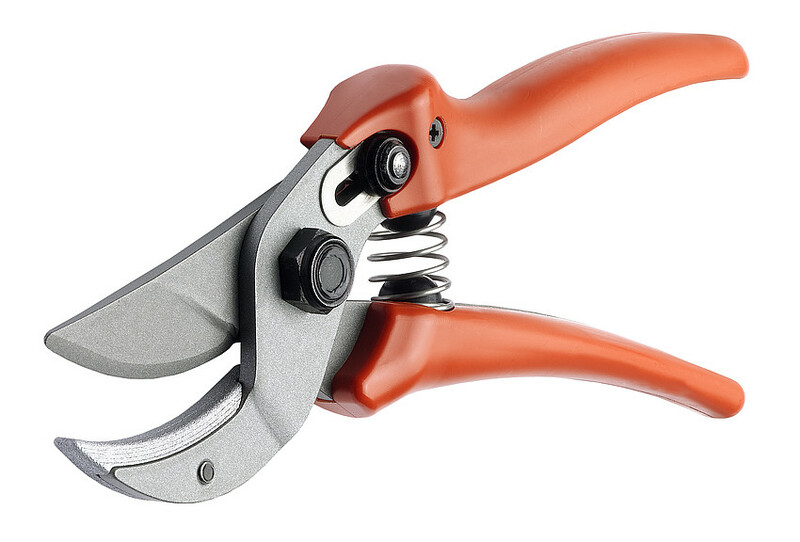 Remember to ensure all your pruning tools are well sharpened and clean before you start. Cleaning the cutting tools between plants with a diluted Detol or similar will decrease the spread of infection from one plant to another. There has been an enormous amount of work been done in recent times by breeders to bring more of these fabulous perennials to the market place with new hybrids and many other species that have not been available before. With their extraordinary diversity of colour and habit over 1800 species with new varieties being added almost all the time, salvias are truly a gardeners’ delight providing rich and interesting rewards for every garden. This spell binding genus has blues to rival the colours of the ocean and sky as well as rich reds, pinks, yellow and white and with every colour combination of these dominant colours. Their diversity in leaf colour and shape is second to none with leaves that feel like velvet, to long narrow leaves of varying colours. Many of the varieties are used for culinary purposes and have delightful scents that can be used to flavour foods of all kinds. 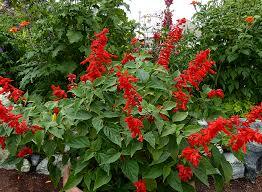 Most salvia species are adaptable to an extensive range of soil types from clay to open sandy soils. Where soils might be in need of improvement it makes sense to add some organic matter like animal manures or compost. Good drainage however is generally advisable and without it there is a greater risk of the less hardy varieties surviving a long wet winter. In gardens where the soil is wet for long periods it is advisable to slightly raise the planting area to allow better drainage. When preparing soils for salvia refrain from adding excess nitrogen. Too much nitrogen will give lush foliage at the expense of flowers. Soil acidity/alkalinity play no great part in the placement of the plants although many of the species are derived from locations where limestone is dominant. Nearly all varieties prefer a full sun position with the exception of a few varieties that will grow in and tolerate shade. Some taller varieties have a brittle branching habit and thus should be planted in a location free of strong winds. Many of the lower growing forms are excellent in a seaside garden. 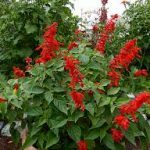 Like all perennials, salvias should be pruned on a regular basis to keep the plant in a compact form and to promote several periods of flowering throughout the year. They are generally pest and disease free with aphids and some powdery mildew being a problem in the summer months. They are a great plant to grow in a container for those who have a difficult location, or to brighten up and area on paving etc. where other plants might have failed. Due to their ability to handle periods of dryness they are an ideal pot plant. Often overlooked these days are the extensive range of annual forms that are available to brighten up the flower garden where seasonal change is required. Colours of reds, white, blues and purple are available and should be planted at the rear of the garden. Low growing annuals like lobelia, pansies and violas make a great autumn/winter combination and a great companion planting to late autumn and winter flowering salvia. 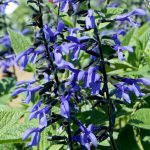 Check out your local nursery for the exciting range of salvia, both perennial and annual, that are now available and brighten up your garden with these rewarding plants. Suppliers of them should have a great range available for planting now. Continuing on from last months’ theme of autumn, April is usually the month that we start to notice the beautiful colours of the autumn trees that are dotted around the countryside: shades of vivid yellows, oranges and reds highlighting the gardens that they adorn. Autumn trees are grown for their beautiful colours, but just as importantly they are also grown for summer shade. When I am asked by a customer about their requirements for a tree I suggest they take a drive around the district and have a look at trees in parks and home gardens to see what they might like. Generally, in this district, a number of the shade trees have been growing for many years and have reached their ultimate size. By doing a bit of research before making a decision about your tree, you will know for sure that a particular plant proposed for a spot in the garden will actually fit that site. Autumn colouring trees come in many forms and every one has a particular feature that makes it a bit more special than another variety. For instance a Claret Ash is a large tree reaching in the vicinity of 15m tall by 12m wide and is more suited to a large space well away from buildings. Its main feature is the beautiful claret coloured foliage in autumn. On the other hand a Chinese Pistacia is a smaller upright tree to 8m by 4m wide with beautiful orange red foliage and is suited to a smaller garden and can be closer to a building. 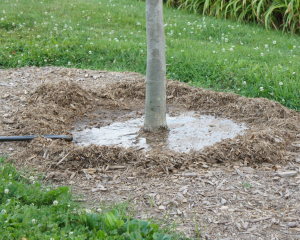 Deciduous trees also have different moisture requirements so planting moisture requiring plants in a dry garden can cause issues throughout summer or drier periods. An example of this is Silver Birch that prefers a higher level of moisture particularly in summer compared to a Desert Ash that prefer and copes better with a drier situation. When trees are used in the overall landscape of a garden the siting is of absolute importance. A large tree can dominate a garden and can often restrict the growth of colourful shrubs that require full sun. If you have a small yard choose a small tree to place on the north or the western side of the house. With the movement of population to small acreages I am often asked what trees I can suggest for a driveway. Again careful planning of the species used in this situation is very important. Availability of water; animal protection, and as the tree matures, allowing enough room when the tree reaches maturity to allow high vehicles like cattle trucks or furniture removal vans to be able to access the driveway. In this case use more upright species like some of the newer varieties of ornamental pears. These are more suited as they give height with the avenue effect without taking up too much room. Trees from nurseries are either container grown or bare rooted. At this time of the year you will only find container grown trees in nurseries and although these might be a bit more expensive the tree can actually be seen with leaves on and is then generally alive and kicking. Care must be taken later in the season if you wait for the bare root trees. Ensure you choose a tree that treated with care and has not been allowed to dry out. Otherwise the ability to re-shoot is compromised. Commence the site preparation with hole digging and composted manure added to the soil to give the trees a great start. Well here we are in another season and autumn brings with it the start of the cooler days and nights and the perfect time for gardening. There will be plenty of things to do with new planting whether tree, shrubs, perennial or vegetable and flower seedlings. I am often asked what is the best season to plant trees and shrubs into the garden and being a nurseryman I will say anytime is good as long as you maintain the plants with mulch and water if planting in the warmer months. Generally though, autumn is the most desirable season as the day temperatures are lower therefore lower transpiration rates and the soil is still warm enough to allow the roots to establish before winter sets in. The plant will then rest through winter and when the first warm days of spring arrive the plant has already settled in and new growth will commence immediately. Being a perfect time to plant, consideration should be given to adding some interesting new plants to your garden. 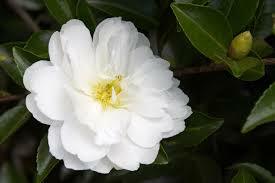 In the shrub department you cannot go past the Camellia sasanqua range. These beautiful autumn flowering plants come in several forms from tall shrubs to groundcovers. Their colours are usually soft pink and whites with some lovely crimson and red forms thrown in for good measure. They have both single and double forms and the groundcovers ‘Marge Miller’ and ‘Snow’ can be planted either as a groundcover or do very well in a pot. Use a premium potting mix if potting and fertilise regularly with a liquid or slow release camellia/ azalea fertiliser. The taller varieties make an ideal screen planting or hedge and will tolerate a full sun position. They are generally pest and disease free apart form an occasional infestation of aphid that are easily controlled with a systemic synthetic insecticide. Another great addition to the garden for autumn flowering are the beautiful Japanese Windflower (Anemone hupehensis). This lovely perennial prefers a site that receives some protection from hot summer sun as any dry stress during summer will reduce the development of flowers. They come in colours of white, pink and dark pink and in single and double forms. Autumn also brings with it the commencement of plantings for the winter vegetable garden and also the autumn through to spring flower garden. The vegetables to plant now will be all the cabbages and cauliflowers, peas, carrots, parsnips and turnips along with leafy greens like winter lettuce, spinach and so on. The list is endless. In the flower garden varieties including pansy, viola, primula, stocks, poppies and wallflowers to name a few can also be planted. Prepare the soils for both vegetable and flower seedlings with some animal manure well forked through and water in with a combination fish and seaweed fertiliser. This will get them started well as natural plant hormones in the fertiliser will reduce transplant shock. Remember as I always mention in most articles, to mulch all your planting with a good mulch like sugar cane or lucerne mulch. This will keep the plants moist and the weed competition down. A few other jobs in the garden like dead heading perennials and roses will encourage them to have one last flower before winter. Do an autumn feed of lawns with a complete lawn food to give them a boosts and to tie them over for winter. Also as the days cool, keep an eye out for a late infestation of aphid. The things to do in the autumn months are endless so get out there and make a difference. Welcome to another year of gardening hints in The Triangle. I have noticed during the early parts of January that the media was announcing that 2015 was the hottest year on record and 2016 is likely to top that. So this year I will ensure that I give some great ideas that will help you on your way to success with the conditions we will be exposed to. The first cab off the rank this year will be to talk about groundcover plants and the benefits they can offer to us in the garden. Ground cover plants come in many forms and categories from conifers through Australian natives to perennials and non-Australian plants. Many are absolute ground huggers but others can reach 50-70cm high and be as wide as 3-4m. There are categories that will tolerate first line coastal to varieties that can handle severe frosts and low water. Others are shade tolerant and many are edible, like herbs. To elaborate on these we will start with first line coastal. Many of the plants that suit this particular situation are Australian natives and it should be well worth mentioning that a stroll along coastal gardens and natural areas will soon give you an indication as to what species are handling this difficult growing area. Species such as Carpobrotus (an Australian native succulent) are very good for dune stabilisation along with Bankisa and Westringea that have groundcover varieties. Myoporum and Hakea both have groundcover varieties. A good non-Australian plant is the Shore juniper (Juniperus conferta) that will mat well and stabilise sandy soils. Moving away from direct coastal we then move into more protected locations with heavier soils and not so much wind. In open sunny positions in these locations the list is endless. Australian natives include Grevillea, Leptospermum, Callistemon and Banksia with many others that are softer perennial types including Scaevola and Brachyscome. Non-Australian plants include groundcover Camellia (Marge Miller and Snow), Carpet roses, Cotoneaster dammeri, Convolvulus and the list goes on. Shaded gardens are always a bit of a problem but here also there are many plants that can be used in combinations with perennials including Camellias, Chinese star Jasmine (often used as a climber) and the very beautiful Gumpo Azaleas. Here also space does not allow me to mention the many others that are available. Herbs are the most likely category of groundcover that do not get much of a mention but there are many of great benefit. These can be used to cover paths within the herb and vegetable garden or used to cover a retained area within the garden. 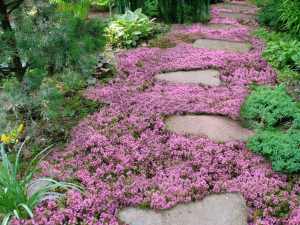 Several varieties of Thyme are suitable for walking on and prostrate Rosemary also falls into this category. The ground preparation for groundcover plants is the same as for all other plants with the inclusion of some compost mixed with the existing soil to give the plants are good start. 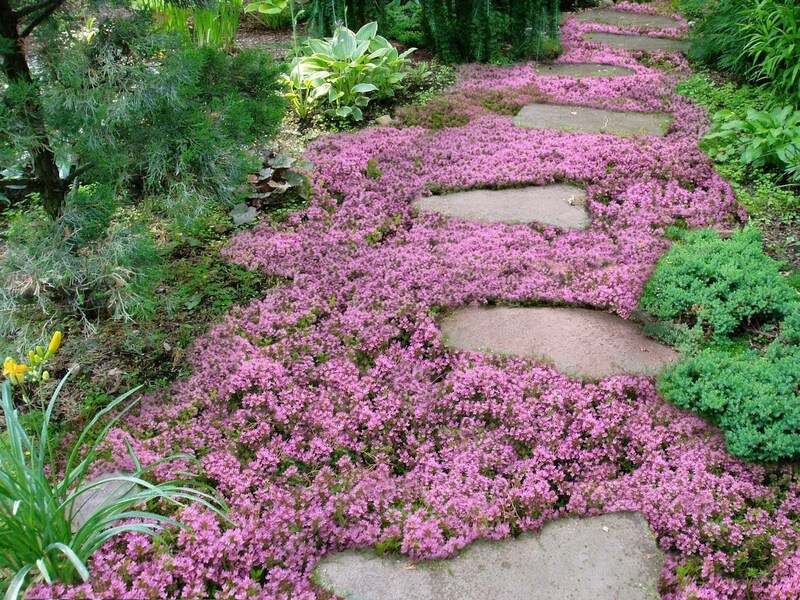 It is a common mistaken belief that ground cover plants will provide weed suppression. There might be some weed suppression but generally weeds will still grow through the groundcovers and will be very hard to remove after the plants have established. Ideally, the best method is to lay down several layers of moist newspaper and cover with a moisture retentive mulch prior to planting and then pull paper and mulch aside sufficiently to make the planting hole. Plant the plants and then water in and pull paper and mulch back around the plant. Over the period the newspaper takes to decompose, the weeds would have most likely died. Some careful hand weeding and spot spraying after that, will ensure the garden stays weed free. It is important to remember that during the course of their life, plants will have failures and successes. If you have tried a particular plant in your garden, don’t give up if that particular variety has not done as well as you expect. Many factors can be at play here including soil types, moisture regimes and sun or shade. Sometimes it will take a couple of tries to get a success and things will not look back after that. Every garden has different requirements so it is important to seek qualified advice before making your choice. Your local nursery person will have many years of experience to help you make the right choice to complete this very rewarding project in your patch. With the ever increasing use of our outdoor spaces, the use of pots as a growing solution is becoming far greater than in previous times. The opportunity is right to offer some hints on how to successfully manage this form of gardening. Probably most important is to decide what you actually want the pots and the plants to achieve. Are they to be used for growing vegetables and some annual colour? Maybe a perennial and a shrub? Or, in some cases, a screening plant to hide a shed or some unsightly part of the landscape? The answers to these questions will help you decide on the type and size of the pot, the actual plant to be used and how then to succeed with the selection of the plant and its ongoing maintenance. The pot’s size is the most crucial selection as a pot too small for the plant will cause it to dry out quickly, blow over in the wind and not contain sufficient nutrient to keep the plant healthy. There are many types of pots from plastic, terracotta and glazed; and for some short term vegetable growing, the use of a polystyrene vegetable box can be used. Generally glazed pots are the best. There are many colours that suit the colour scheme of the home and these pots have a better moisture holding capability than other styles. 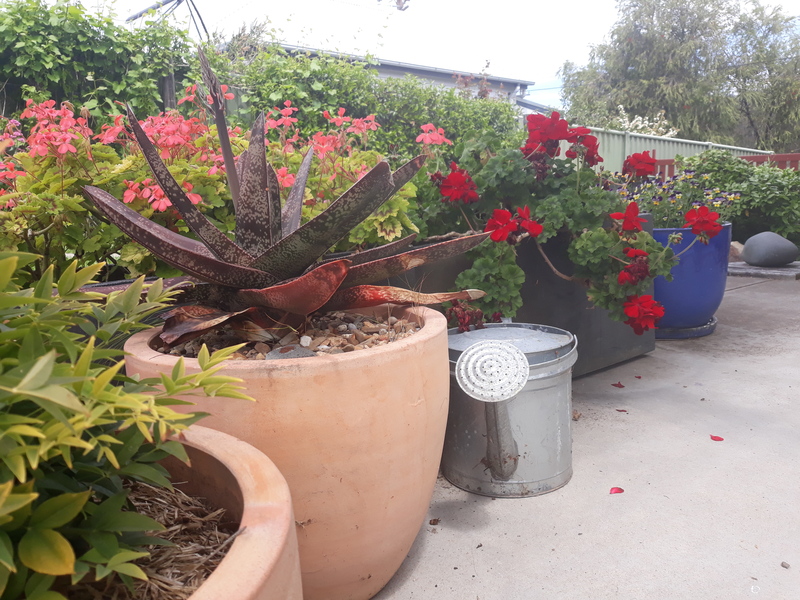 Terracotta pots are very stylish but have a tendency to dry out so if this style is to be used, seal the inside of the pot with a terracotta sealant. Plastic and polystyrene pots are best used where the pot is to be used for the short term as they tend to break down under strong sunlight. A useful hint when selecting a pot is to use a straight sided or V shaped pot so the plant can be easily removed. A pot which is belly shaped is nigh on impossible to repot without causing serious disturbance to the root system. After the decision has been made about the pot the next decision is to what to plant. Consider the eventual size of the plant remembering the larger the plant grows the larger the pot should be. A plant that is to be used for screening should be in a pot that will also act as an anchor in a windy site. Too small a pot will simply just blow over and in most cases smash. If you are growing annuals, herbs and vegetables, a shallow pot will suffice as they are all generally shallow rooting and do not need a great depth of soil. Next comes to what type of potting mix to use. In most cases a premium potting mix with some slow release fertiliser included and some water storage crystals is the best. There a many types of mixes out there and I can guarantee that the cheaper the mix is to purchase, the lesser quality it is. For plants that are going to be in the pots for an extended time, I suggest a premium potting mix. If you are growing vegetables and annual flowers you can use a cheaper mix but you will need to fertilise and water more often as these mixes do not have any moisture or nutrient holding capabilities. These cheaper mixes will be of no benefit to the plants after a season or two. Do a lift test to ascertain whether you are getting a quality mix: the lighter the weight the poorer the quality. The lighter weighted bags usually consist of tan bark and are either 20 or 25 litres against the 30 litres of a premium bag. Watering and fertilising is of absolute importance. Vegetables and annual flowers will need watering several times a week and fertilising every ten days or so with a liquid fertiliser like a fish or seaweed based fertiliser. Shrubs and longer living plants also need watering and fertilising on a regular basis although some fertilising can include a specific slow release fertiliser for the particular group of plants you have used. Do this three or four times a year as well as the liquid food on a monthly basis. During the cooler months this can be cut back as the plants are not actively growing. Just a few other things to remember: from time to time check that the drainage holes haven’t become blocked by roots; rotate the pots to get an even all over growth and prune when necessary. Good luck with your efforts. From us at the Spires Nursery we wish you all a safe and loving Christmas and holiday season. As the warmer months progress there are a number of things we should be attending to in our gardens to prepare both ourselves and our gardens for the warmer months ahead. If you haven’t already thought about creating summer shade in the garden, now is a good time to look at where you might need it, both for plants and just as importantly to shade the home. Deciduous shade trees are an absolute integral part of the overall landscape of any garden. They not only provide a covering for some of the more delicate plants in the garden but also can be used to throw shade over a western window or provide some protection for an outside sitting area, whether attached to the home or within the outer garden. Care must be taken, however, to locate the tree in such a position so as not to cause later issues with the proximity to the house or other buildings. My suggestion is to plant the tree at a distance of at least one and one half of the radius of the tree from the building. In selecting plants for under the tree, select plants that either enjoy full or part shade but can also handle any winter condition that might come their way when the tree drops its leaves. Another important thing to keep an eye on is water under the trees. A light shower of rain that can provide some respite to the garden on a warm day might not necessarily reach the ground under the dense canopy of the tree so additional watering will be required in this case. Mulching is also another very important task to get on with. I regularly discuss this in the column as I think that good mulch can be the saviour of gardens when in the height of summer our rainfall becomes less and the pressure to provide water to our gardens increases. There are several forms of mulch that can be used including wood mulches, lucerne or sugar cane and different forms of gravel. Hard wood mulches can be used around more permanent trees and shrubs and the softer lucerne and sugar cane mulches on the flower and vegetable beds. The softer mulches don’t have a great life span but as they decompose they add nutrition to soils and in their breakdown improve the texture and structure of the soil. This will encourage worm activity and also give the plants a better ability to take up nutrients in the soil. When applying nutrients to plants that have wood mulches, it is good to pull the mulch back from around the plant, apply the fertiliser and put the mulch back. Remember to apply the fertiliser at the drip line of the plant and not up against the stem or trunk. General garden watering in the warmer months is also a very important task and it is crucial to the plants survival that it is done in a proper manner. Lawns should be deep watered about once a week and not daily as I see some gardeners do. Deep watering encourages the root system of the grass to grow deeper into the soil which then gives it the ability to withstand longer periods of dry. This is the same for trees and shrubs, however vegetables need to be watered a bit more frequently to have them grow faster and therefore crop sooner rather than later. Insect pests are out and about so a keen eye should be kept on plants for signs of aphid and thrip attack, citrus shield bugs and citrus leaf miner. A systemic spray like Confidor will control the sap suckers and some pest oil will control the leaf miner. One of the most damaging insect pests that will also be on the move are fruit flies. There are several methods of control including traps that will indicate the flies are present. Then appropriate chemical application is warranted or sticky traps that will also catch them. A fairly recent product is an insecticide derived from naturally occurring beneficial soil bacteria called Spinosad, which kills fruit flies; and a protein based bait, which fruit flies can detect from several meters away is also now available. Although we haven’t had a lot of wet weather at the writing of this column and with some early stone fruit setting, keep an eye out for fungal diseases and take appropriate action.